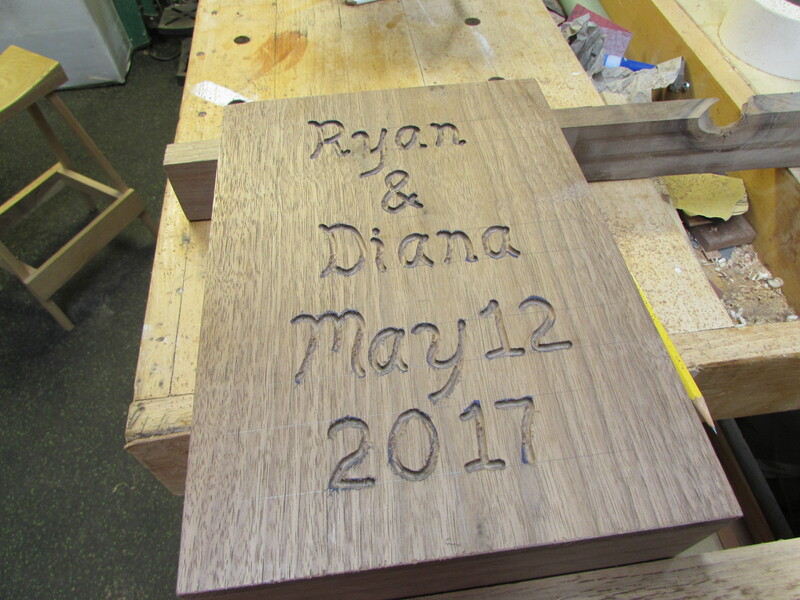 I have one last project for Diana & Ryan’s wedding. 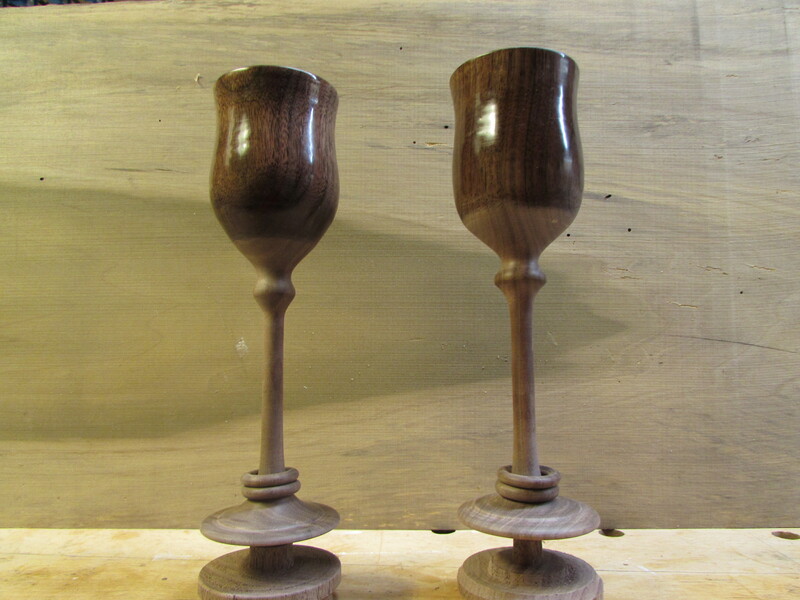 Since we have been working on the lathe a lot in my shop lately, I thought I would try to make a set of wedding goblets for the couple to toast with. 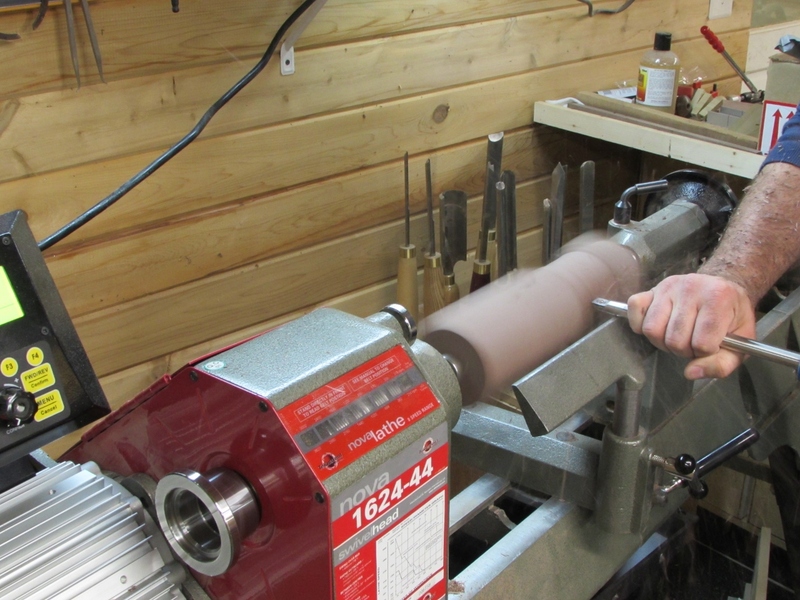 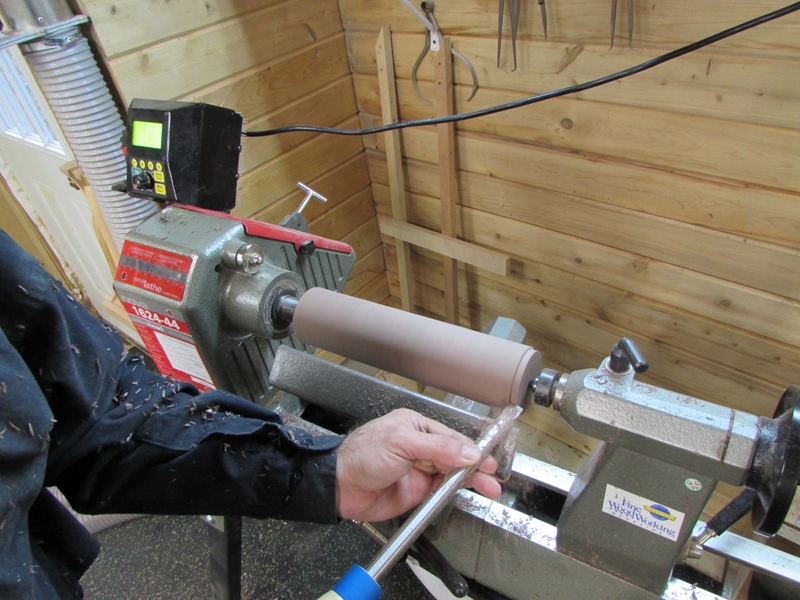 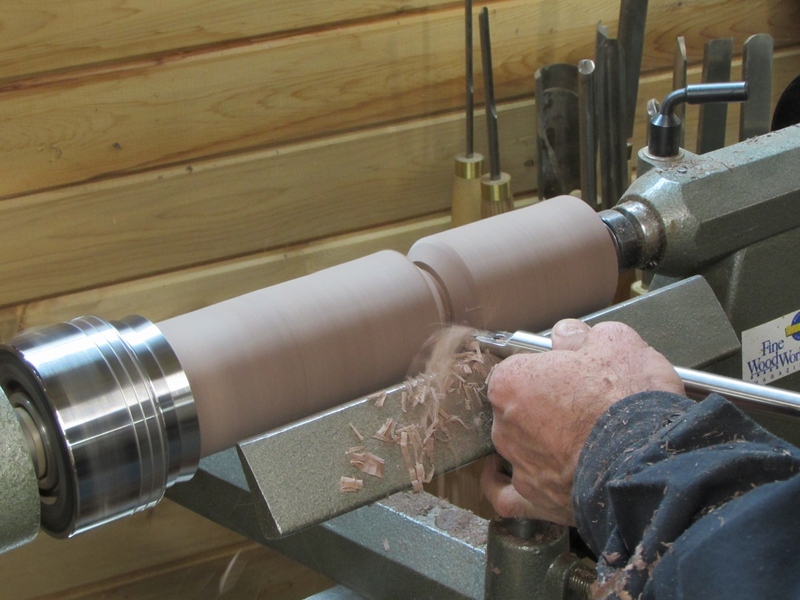 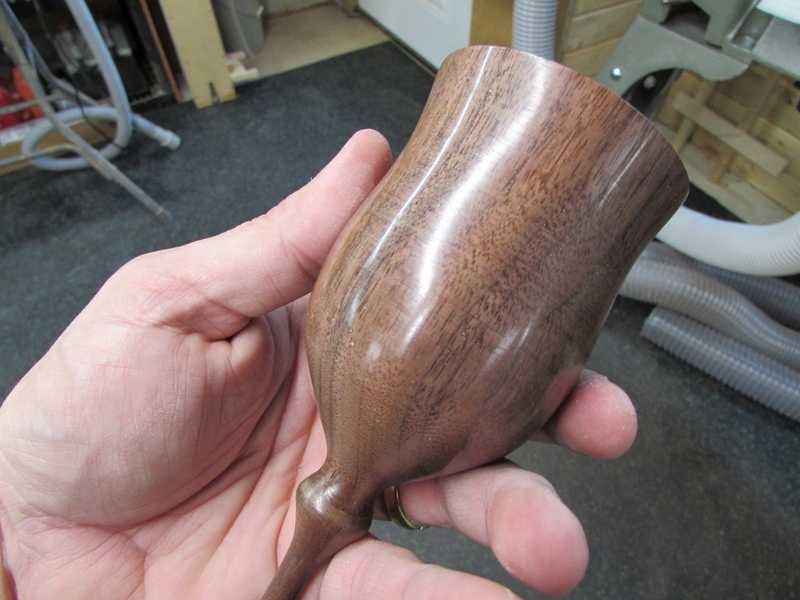 I have very little experience on the lathe, and I have never turned a goblet before, so I did a bit of homework, and turned to YouTube. 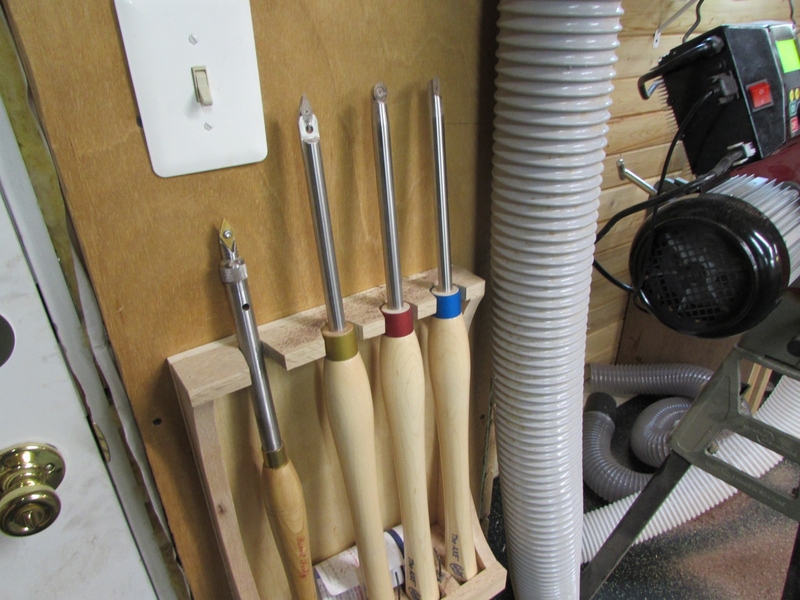 Luckily I stumbled upon Mike Waldt’s YouTube channel early on and only needed to watch one or two videos to have enough information to start experimenting. 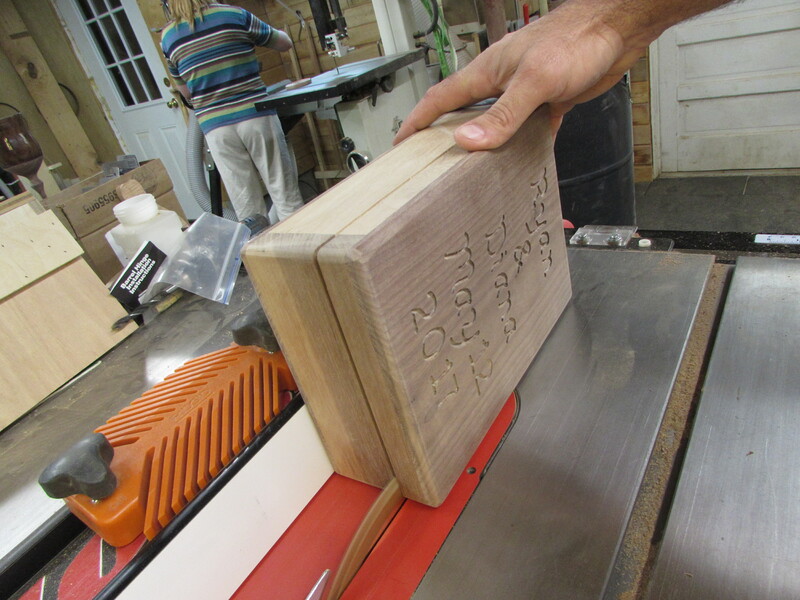 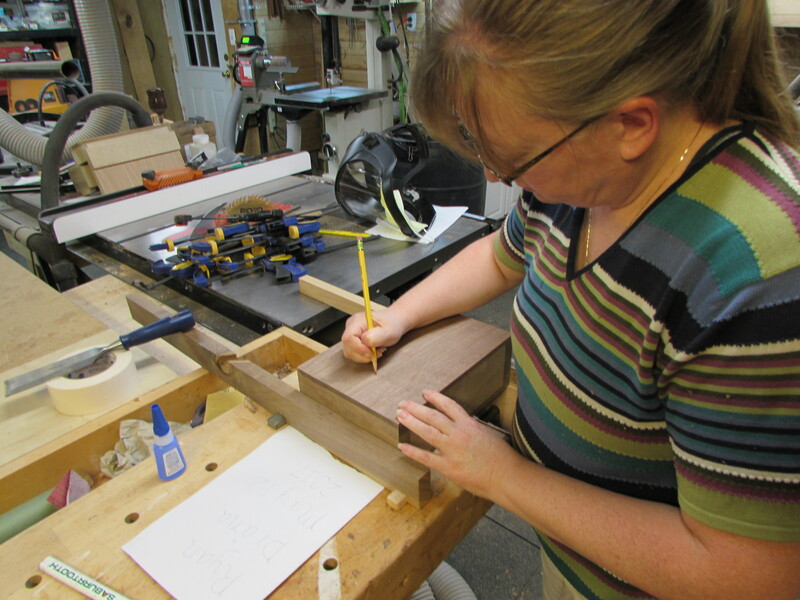 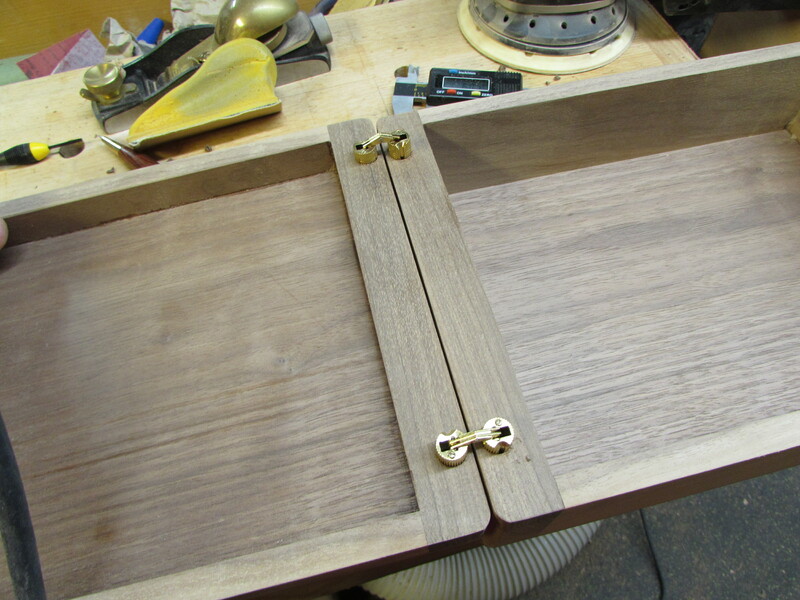 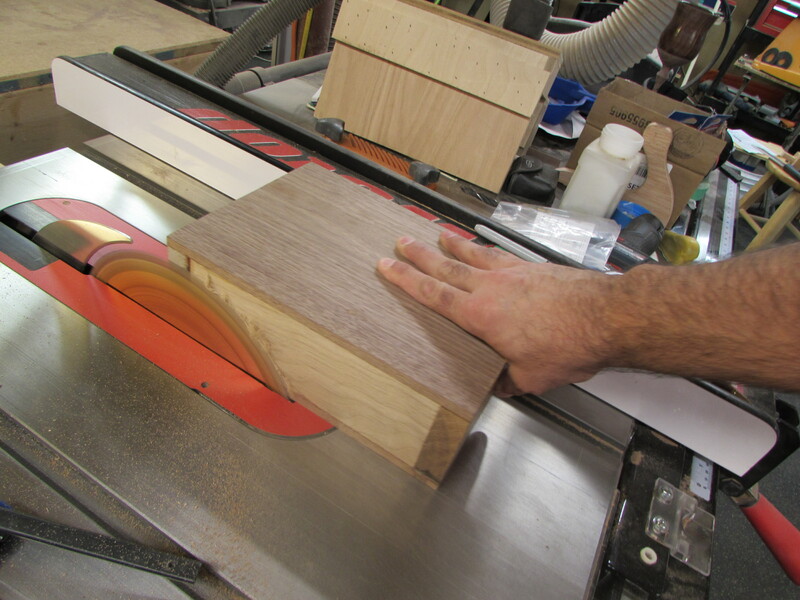 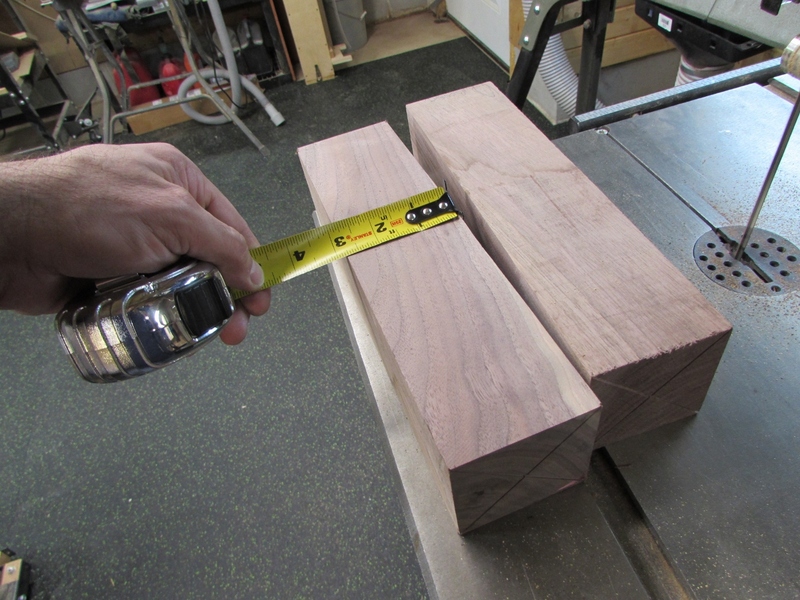 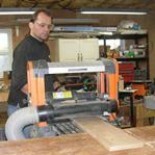 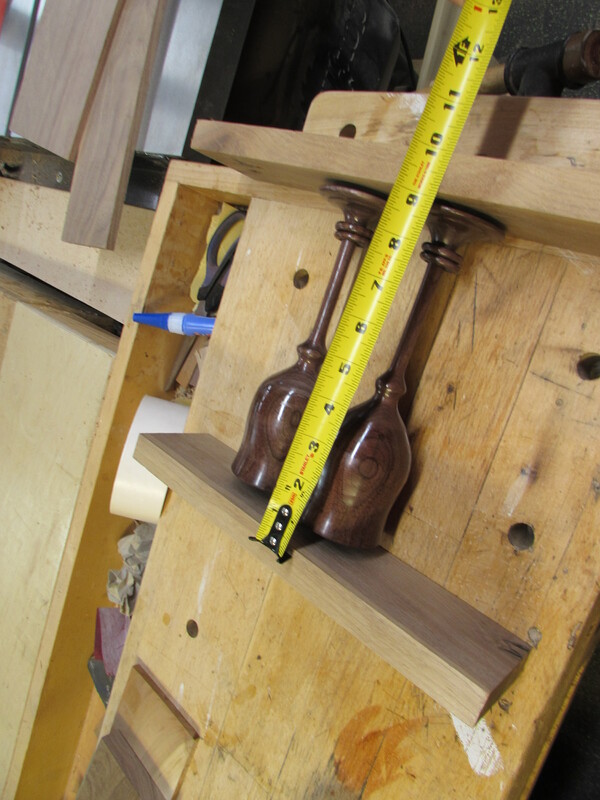 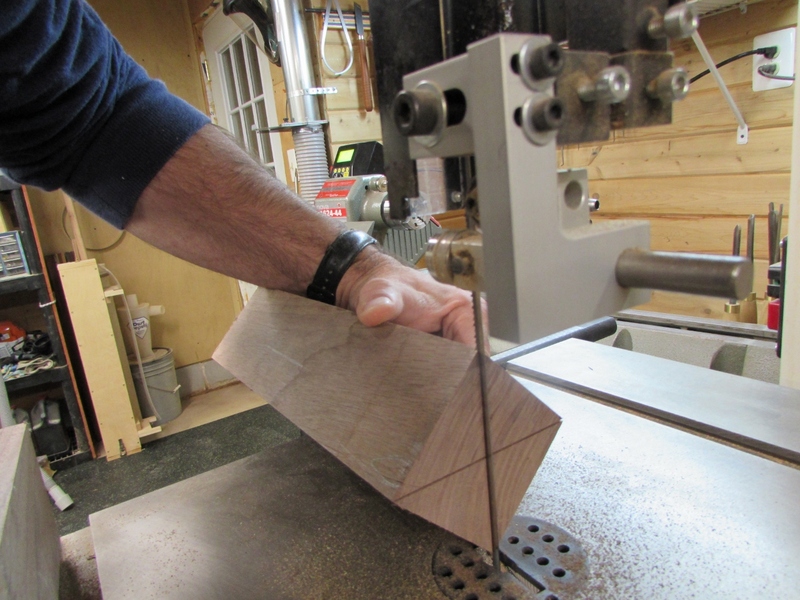 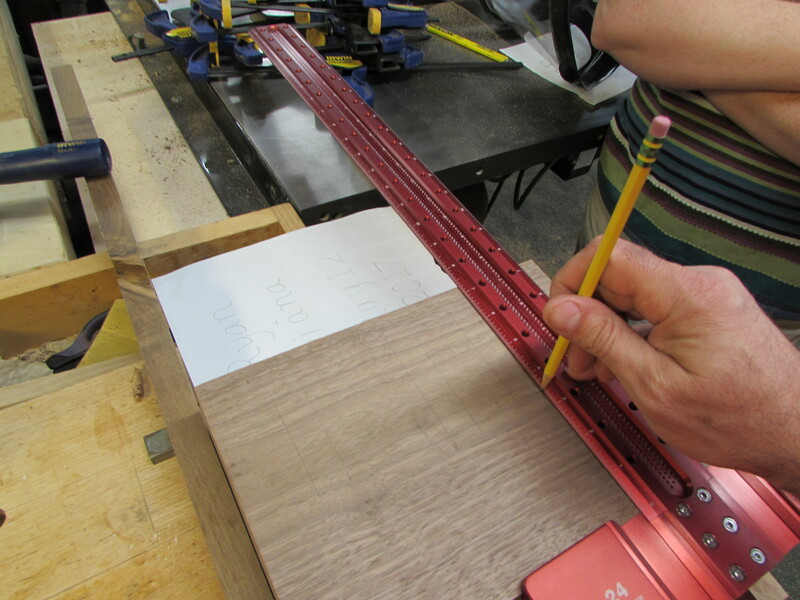 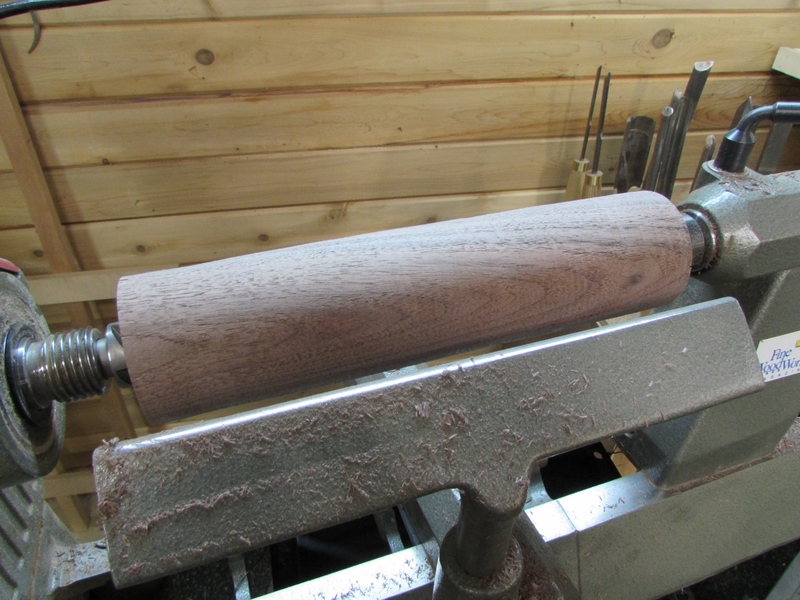 I started with two 3″x3″x11″ long blanks of walnut. 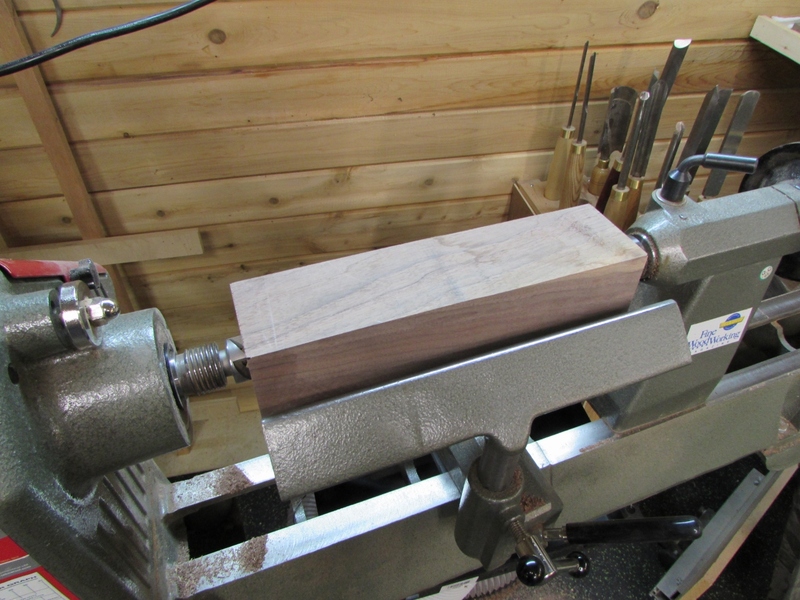 I went through the usual drill of finding center and loading the blank onto the lathe. 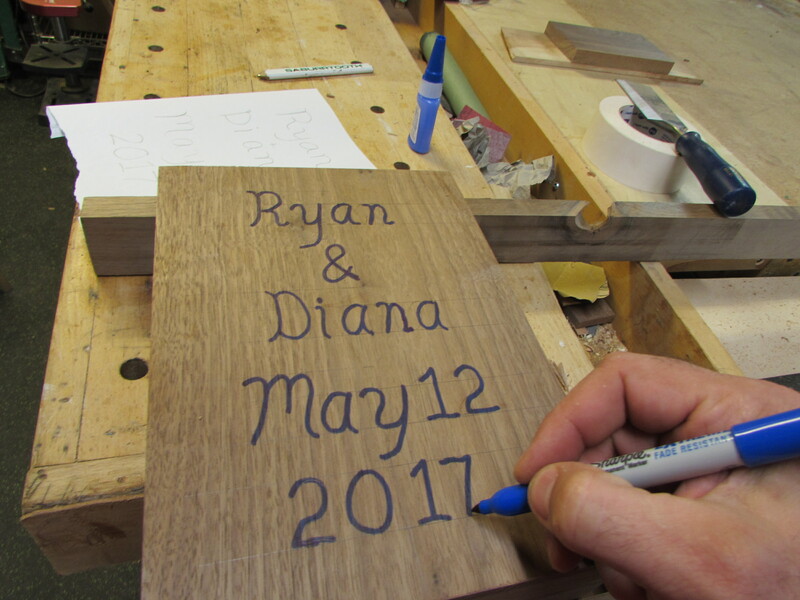 I quickly roughed the blank down to round. 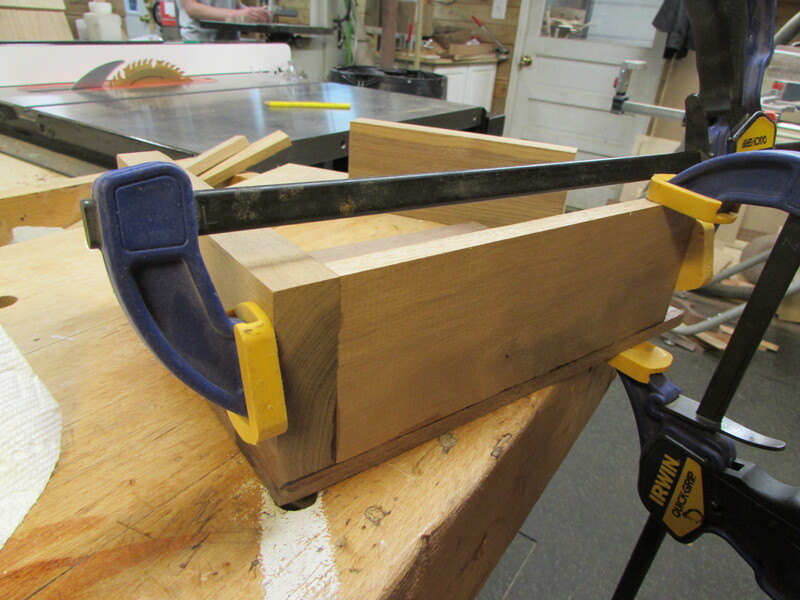 Then I put a dovetail on the end that I wanted to mount into my chuck. 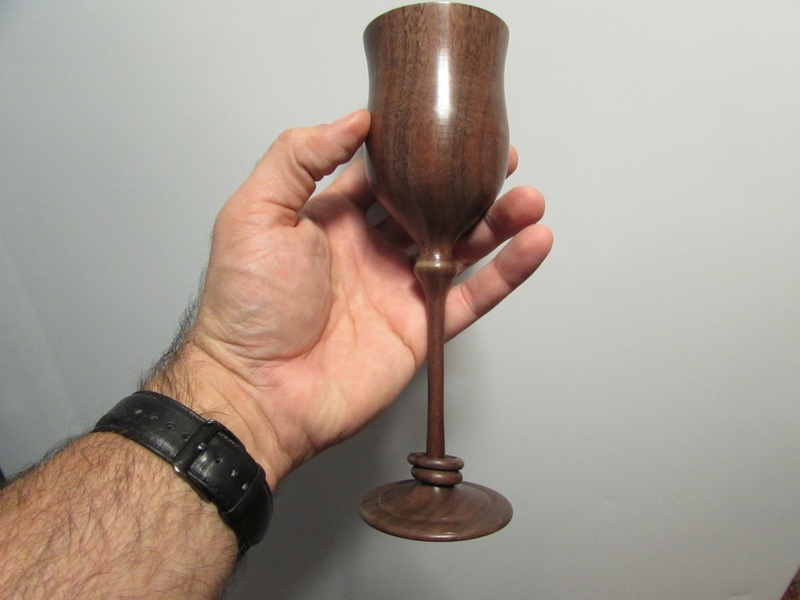 I used a wine glass, from my wedding, to estimate the size, and marked it on the blank. 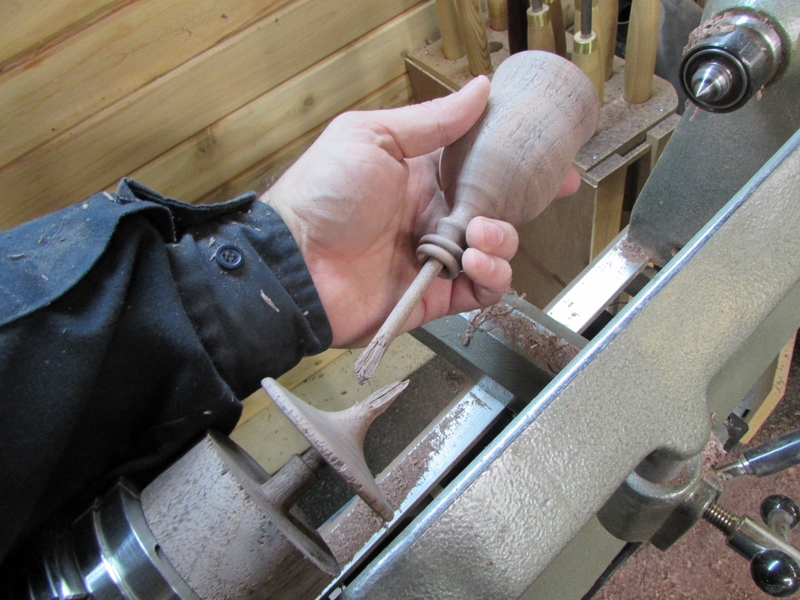 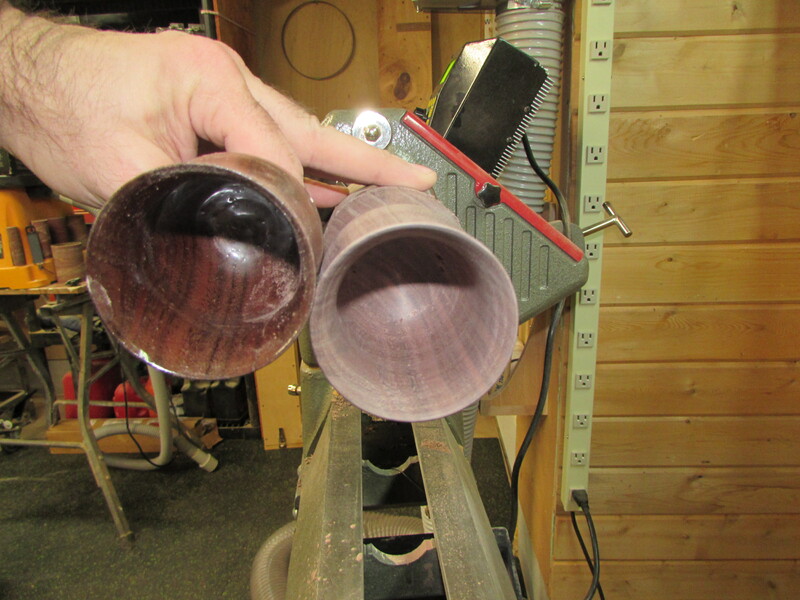 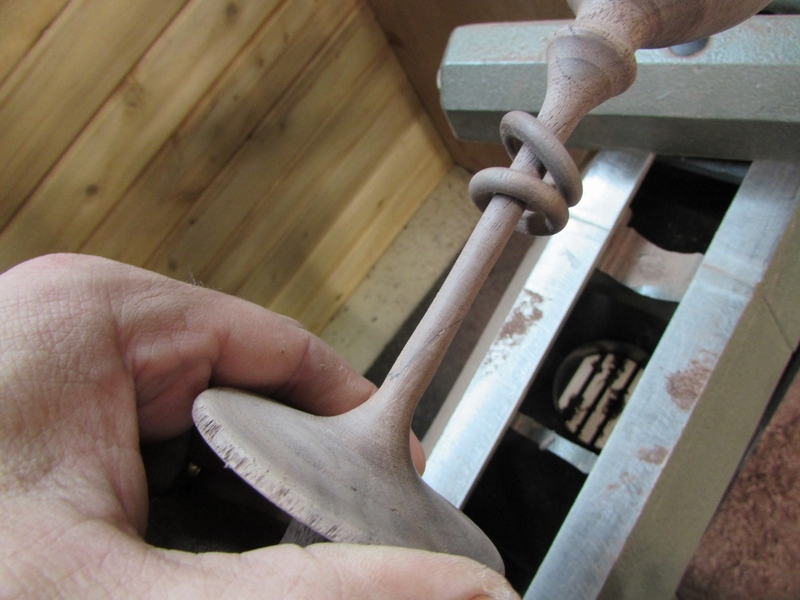 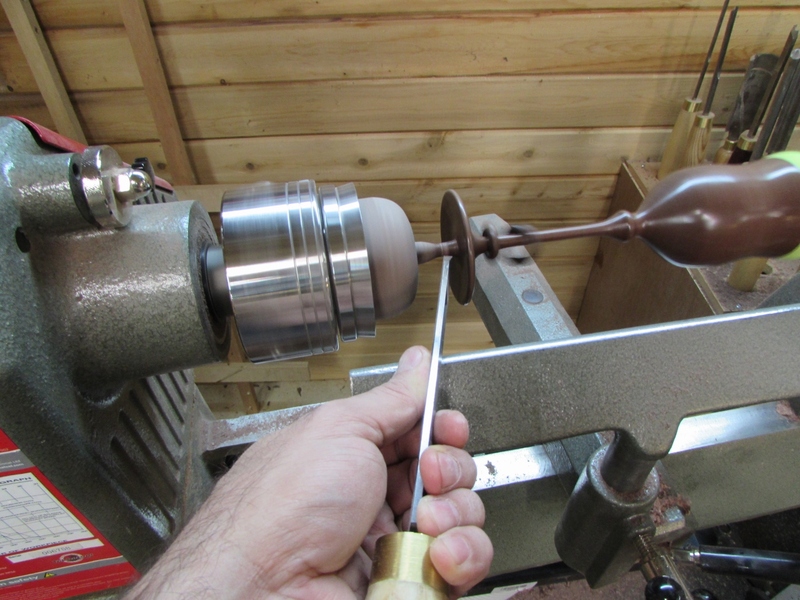 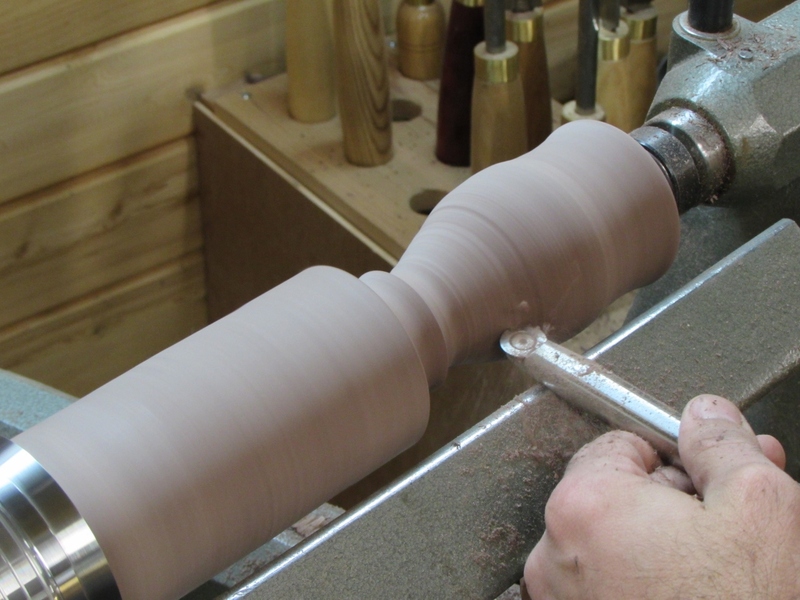 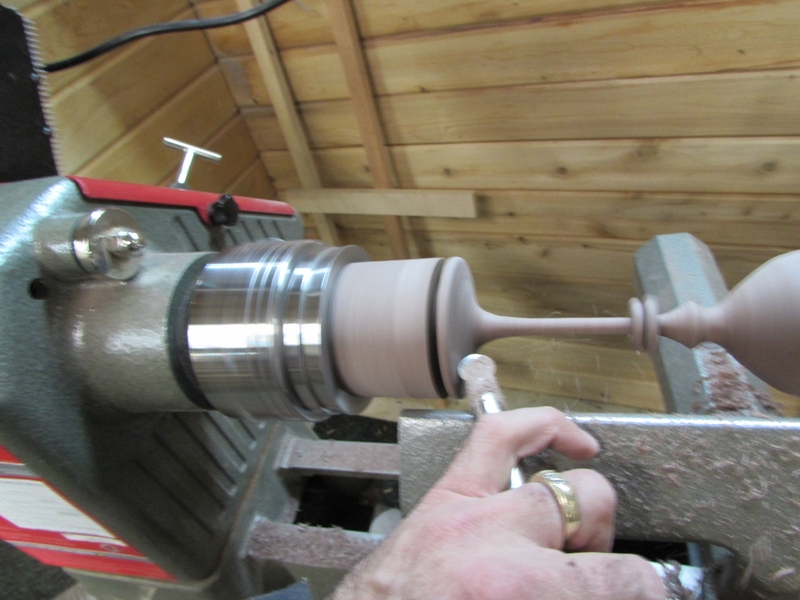 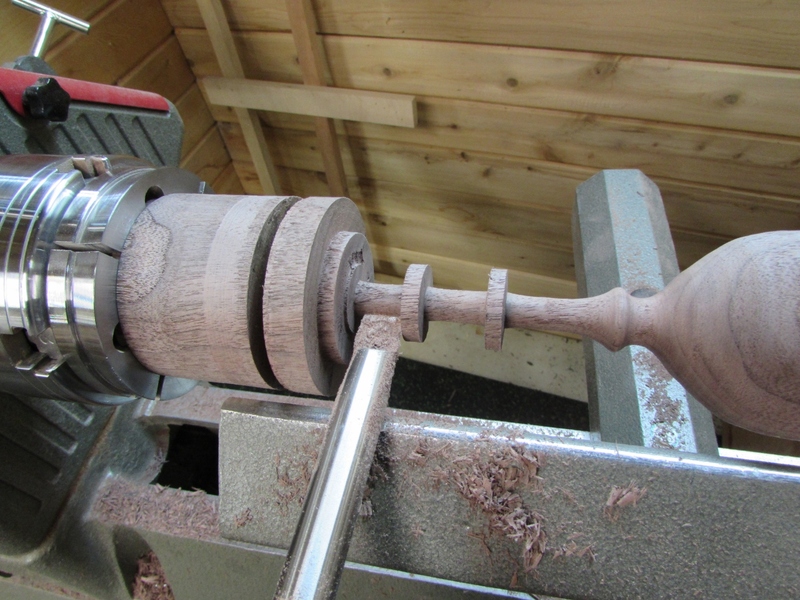 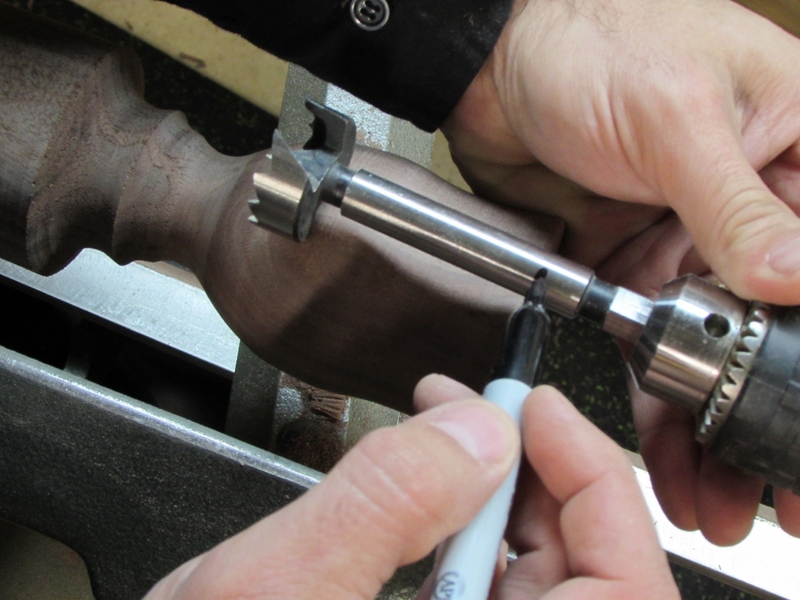 I roughed out the shape of the cup, then marked the max depth on my largest forstener bit. 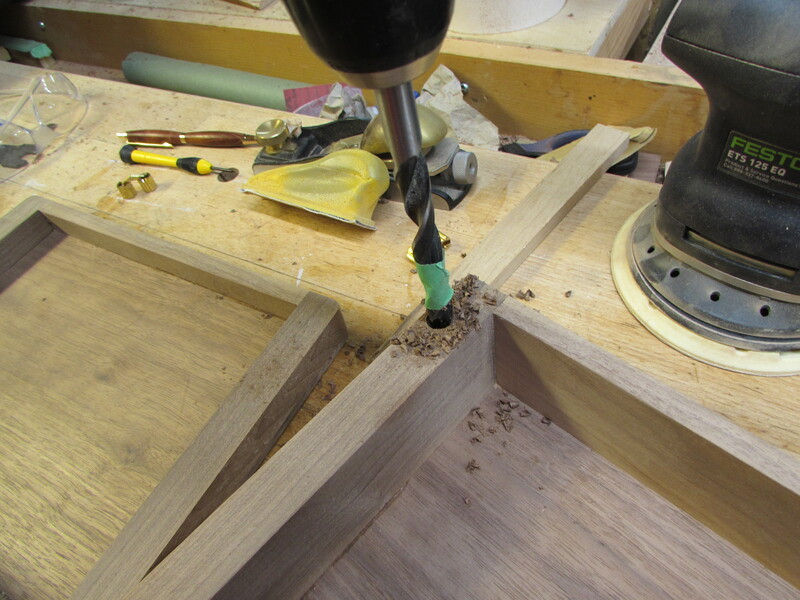 I drilled out a good bit of the cut, then started scraping out the inside. 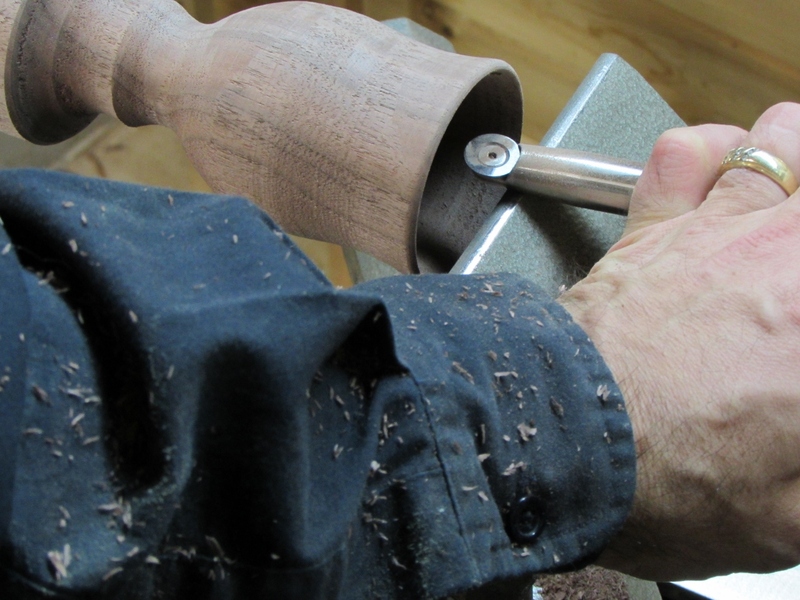 I found it difficult to see, so I started holding a flashlight against the cutting tool, while I was cutting. 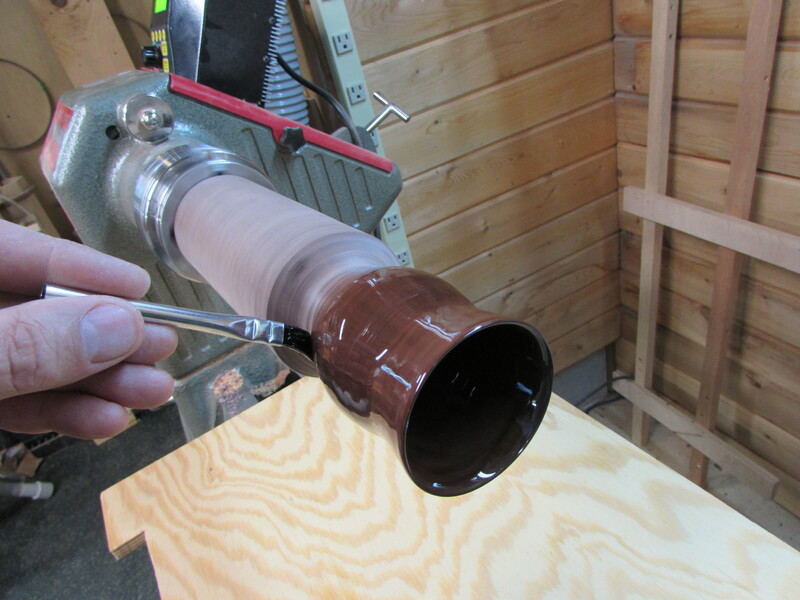 When I got the side walls as thin as I dared, I sanded the inside and outside of the cup. 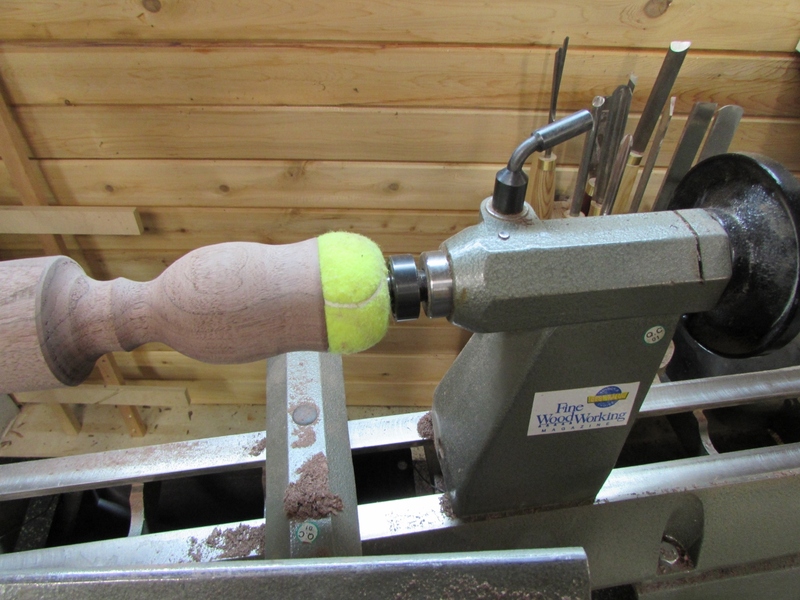 In order to start cutting the stem, I used Mike’s method for stabilizing the cup and pressed a tennis ball between the cup and live center. 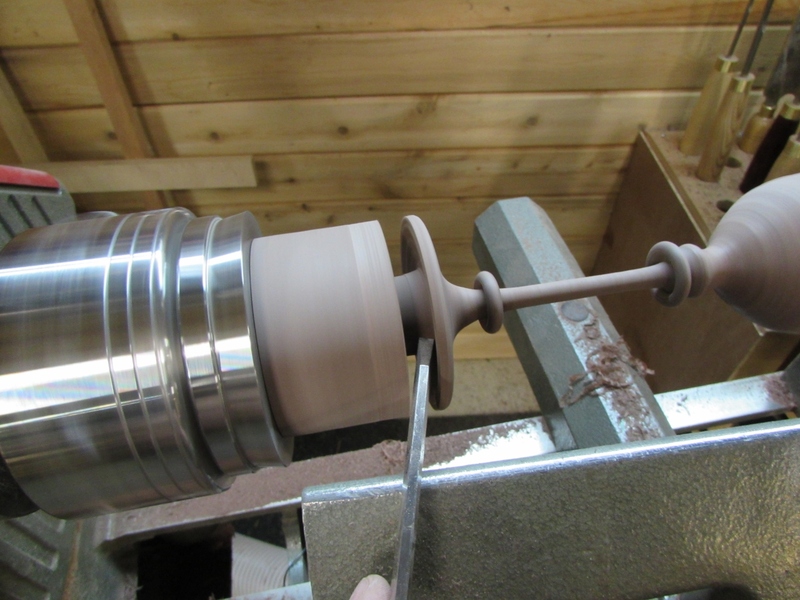 That seemed to work very well, as I shaped the stem. 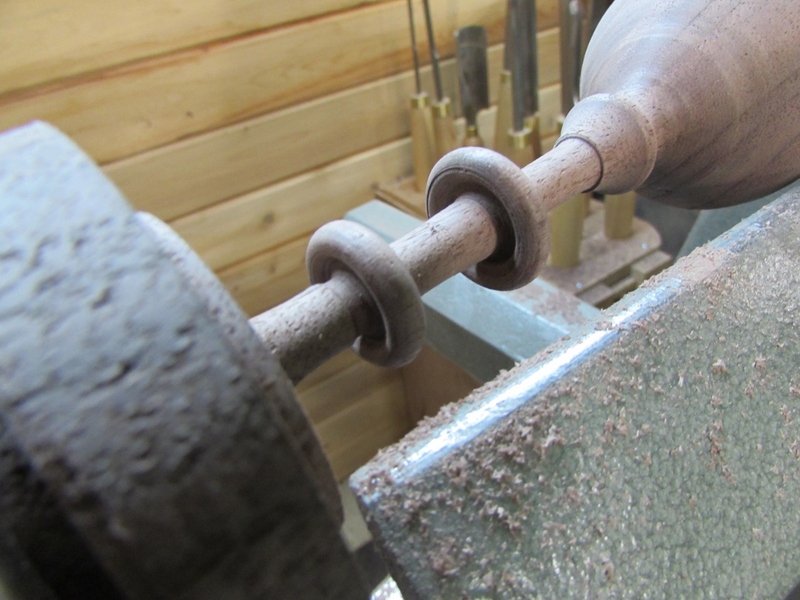 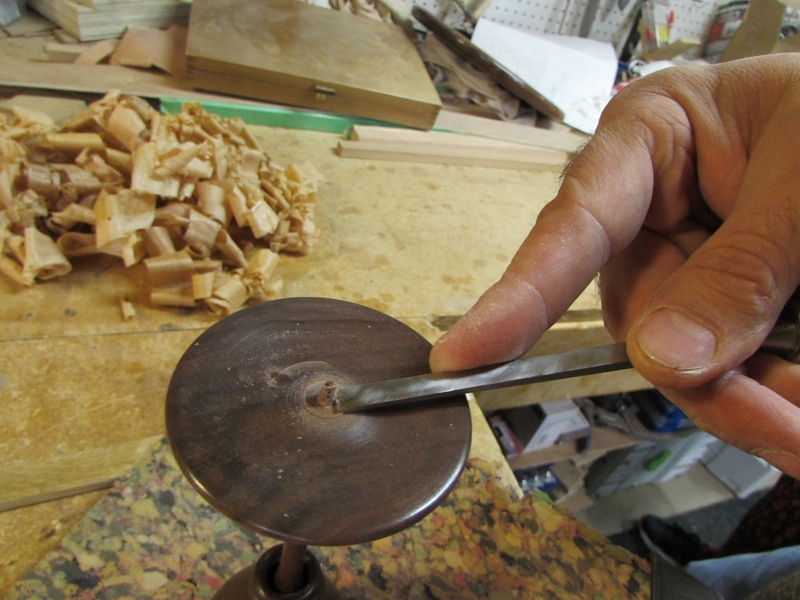 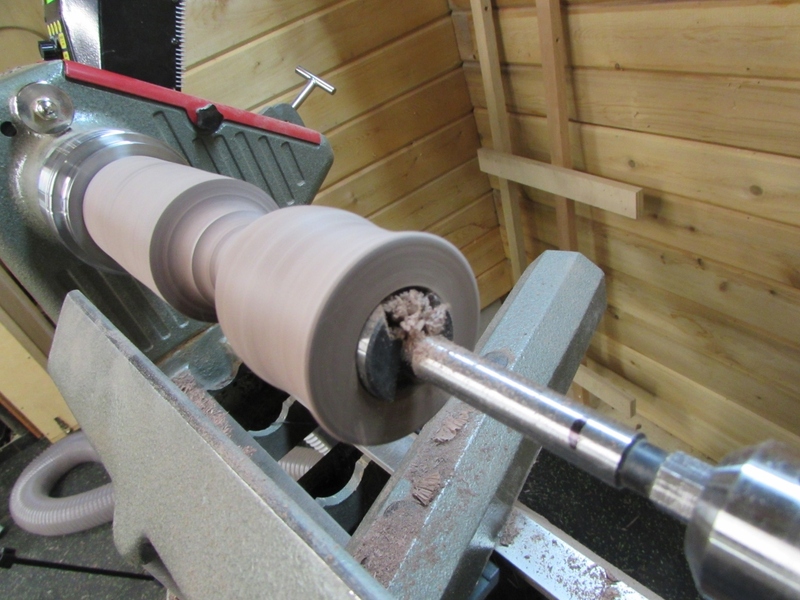 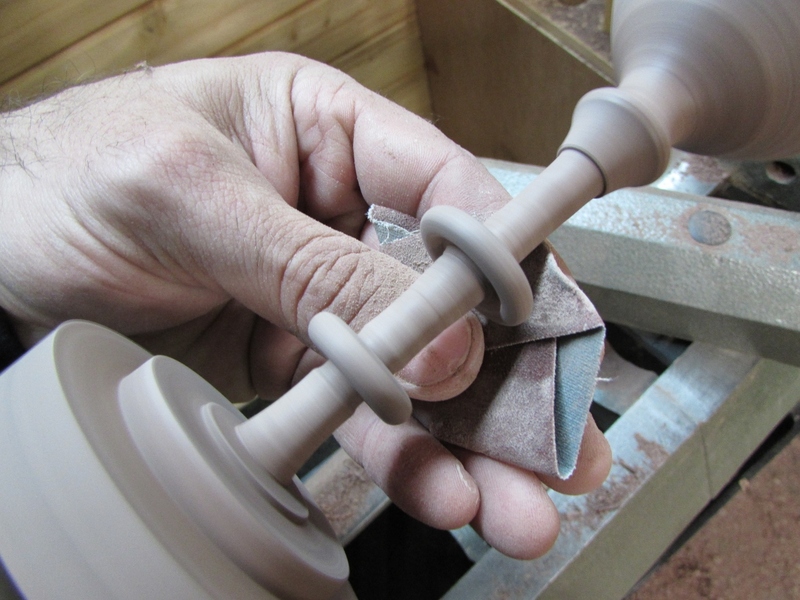 To create the captive rings, I started by cutting two rounded off ribs. 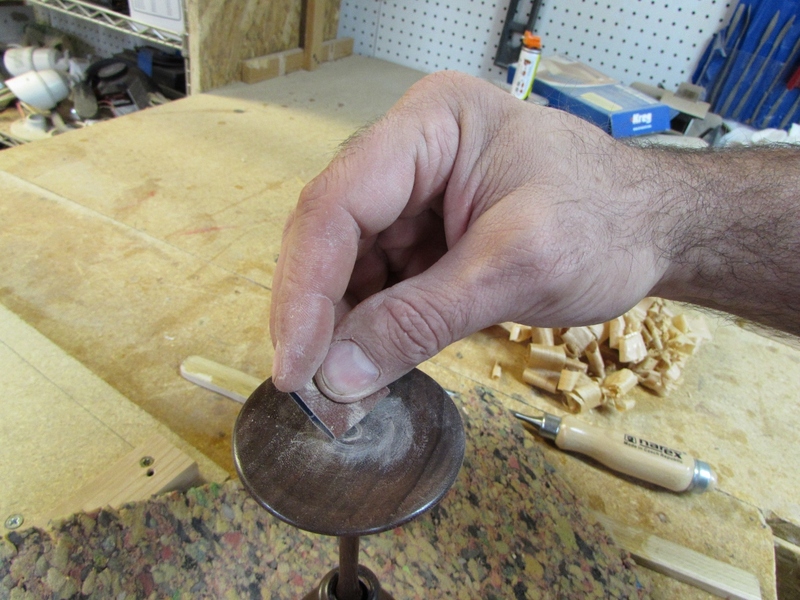 Then I undercut them with my captive ring tool. 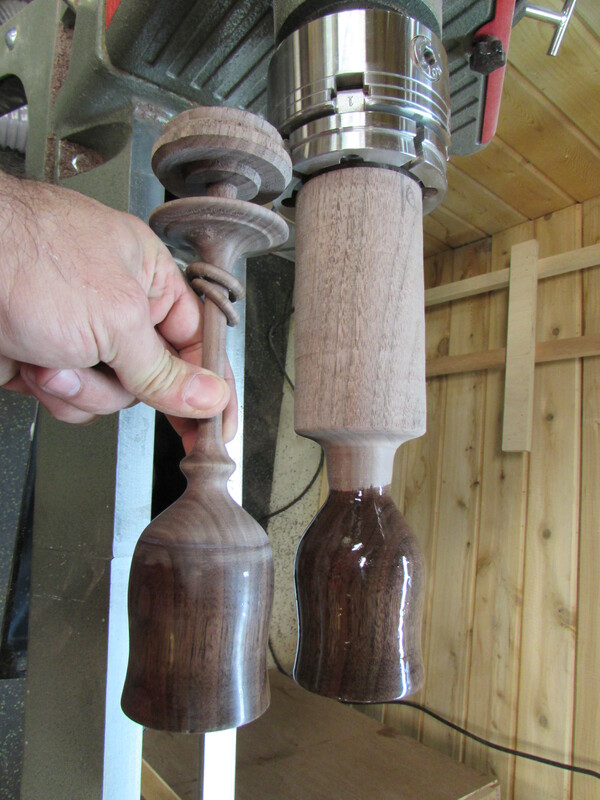 I sanded them down to 600 grit while they were still attached, then finished cutting them. 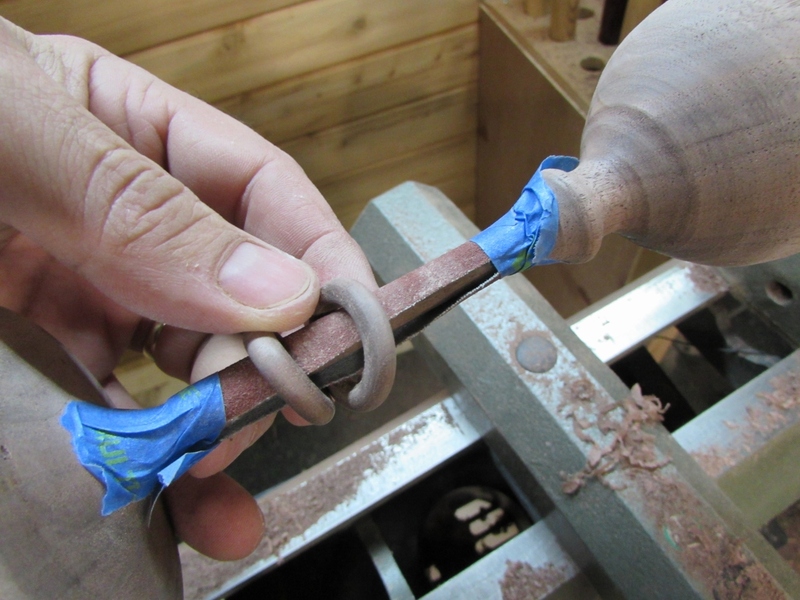 I found that wiggling them back and forth over the ridge that was left behind easily breaks away any leftover material on the inside of the ring. 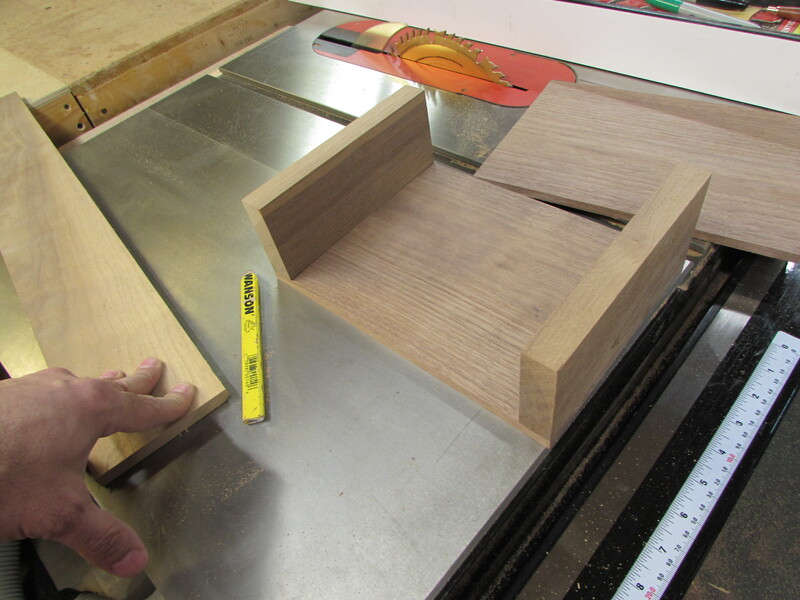 The final step was to cut away the shape of the base then to undercut the bottom. 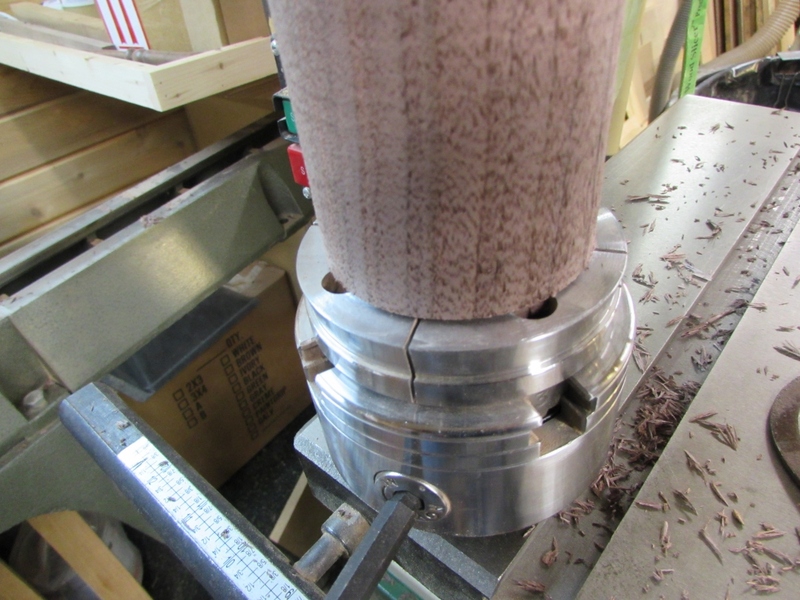 Noticing a few chatter marks on the cup, I made the big mistake of trying to go back and scrape them away. 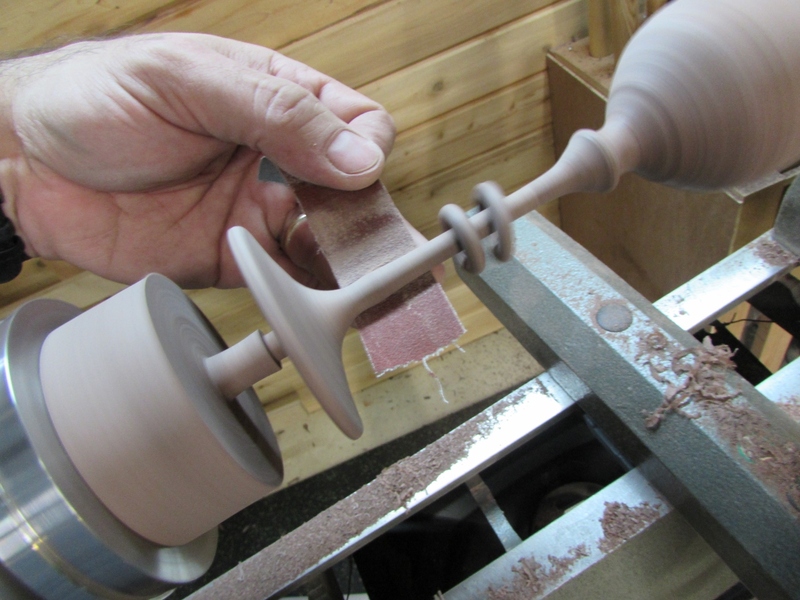 This promptly created so much more chatter, with a thin spindle, that it blew apart. 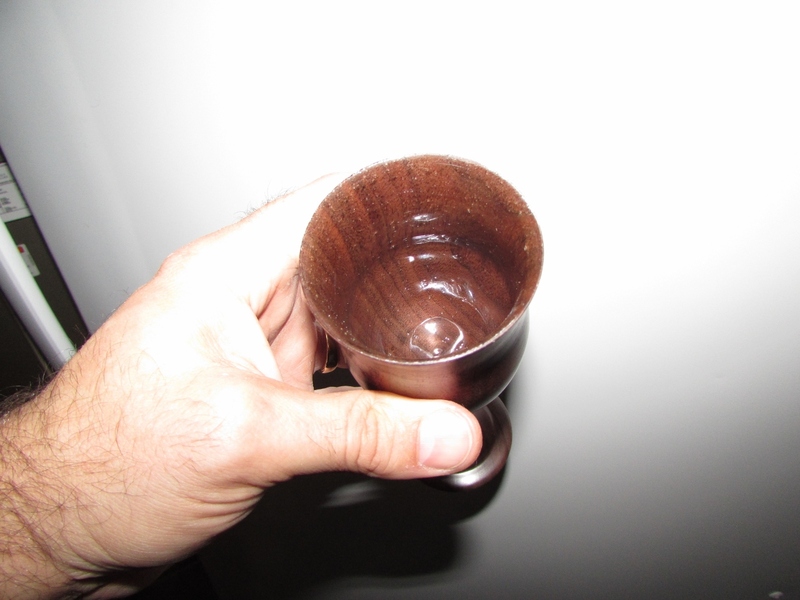 In order to finish experimenting with the goblet, I tried to super glue it back together. 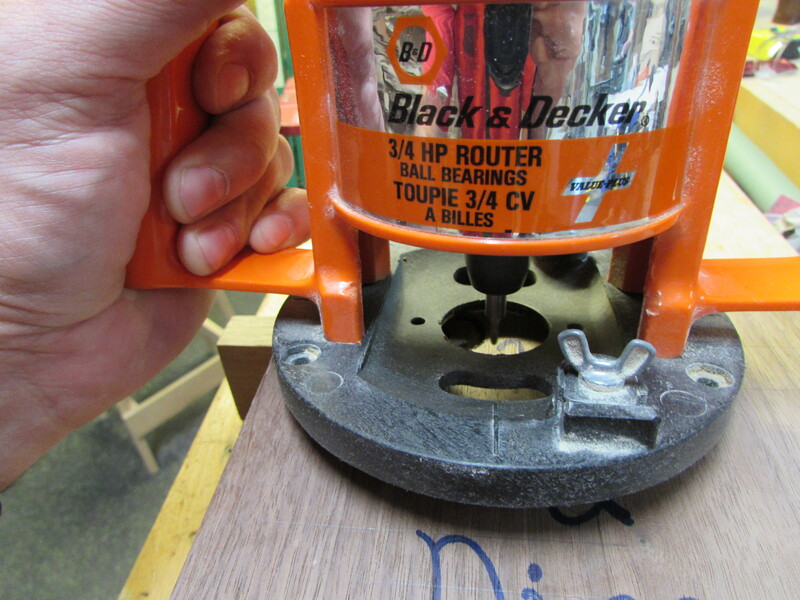 I was successful, but the crack was still visible after sanding. 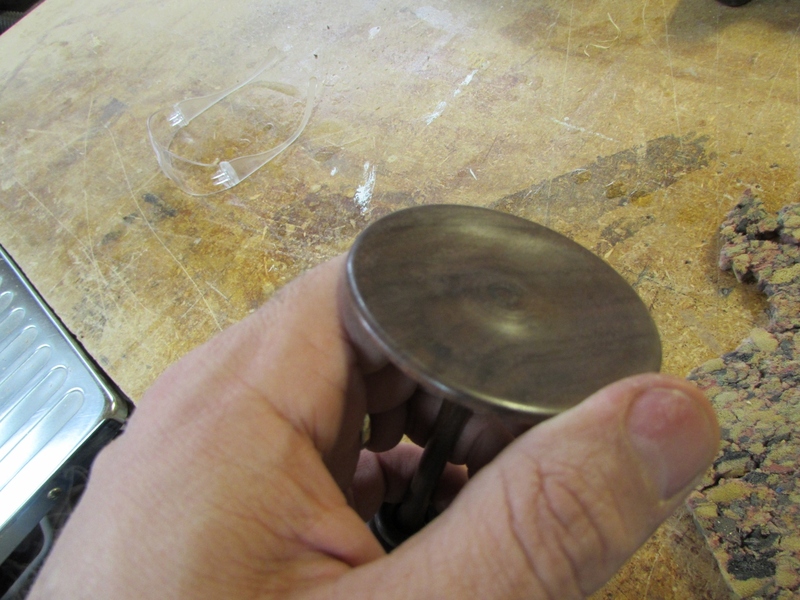 I tried mounting sandpaper to the stem to clean up the inside of the rings, but the tape wouldn’t stay on very long. 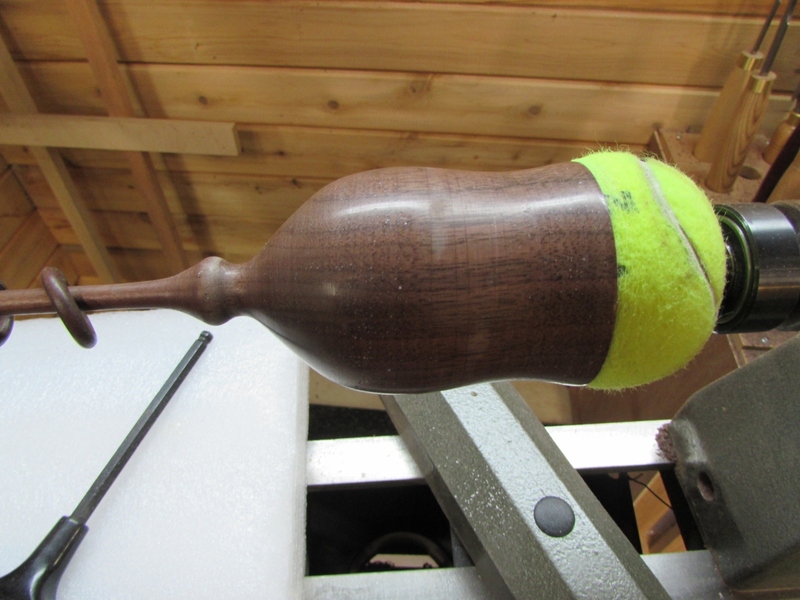 After a bit of sanding, I had something to finish. 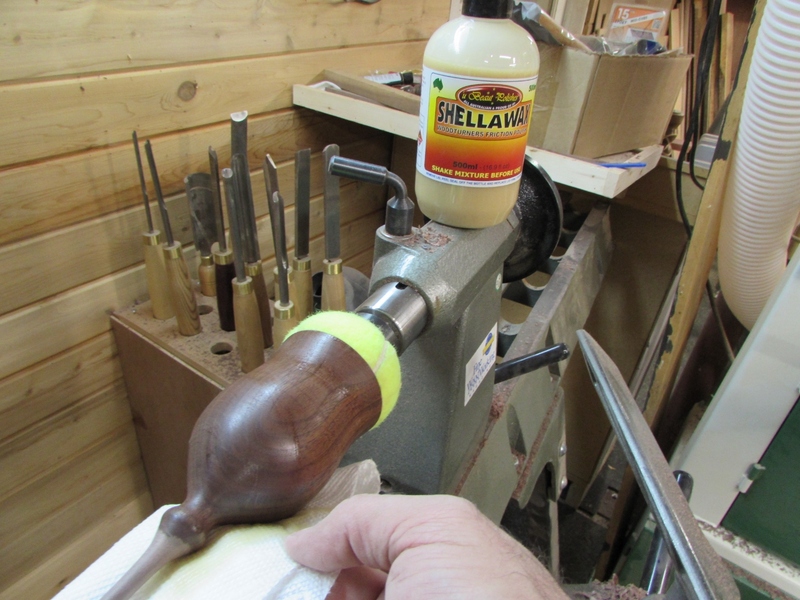 I applied a bit of shellawax to see how it looked, and it turned out pretty nice. 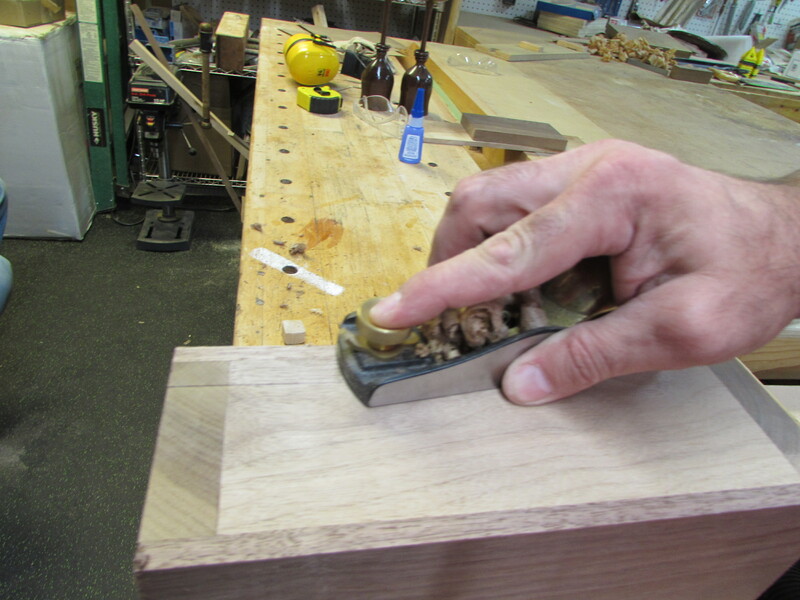 I cut away the last bit of the blank and sanded down the nub. 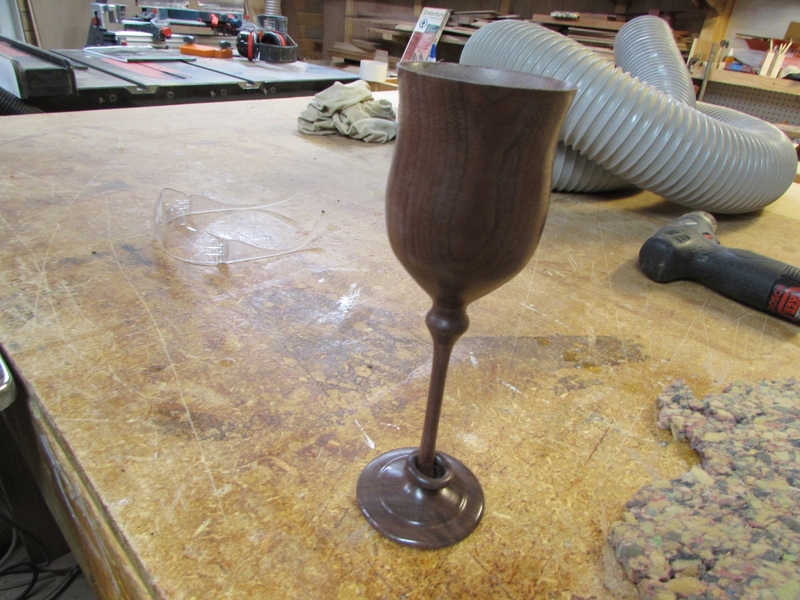 It looks nice, but now I have to figure out how to line the cup to allow the goblet to hold alcohol . 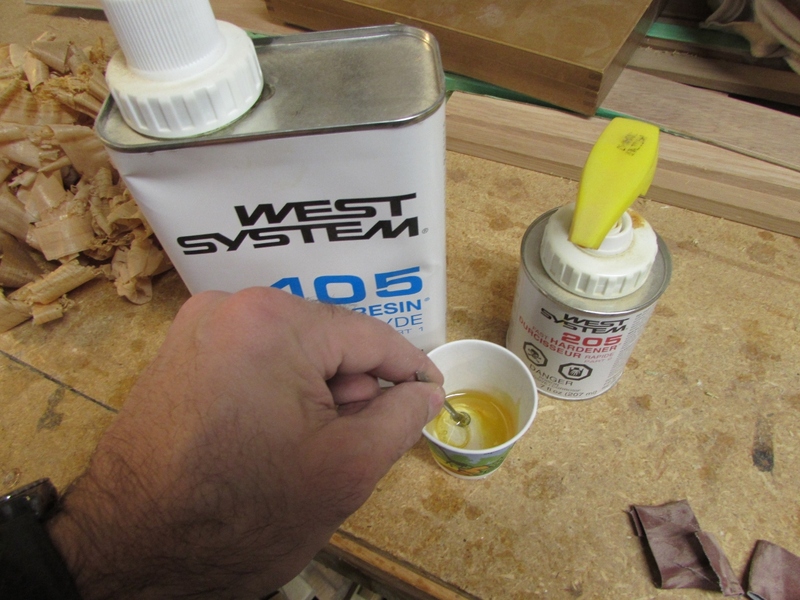 After looking at my selection of finishes, I decided to try West System’s epoxy. 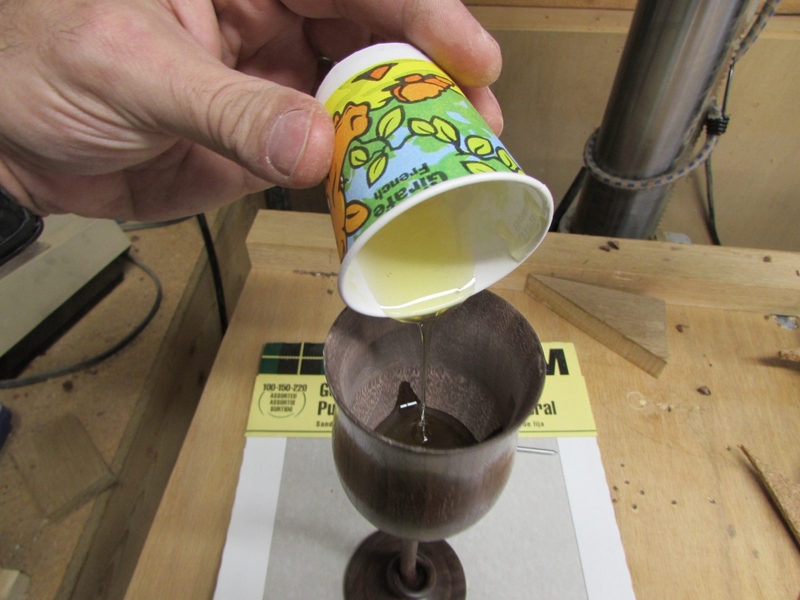 I mixed and poured it into the cup, then used an acid brush to spread it around. 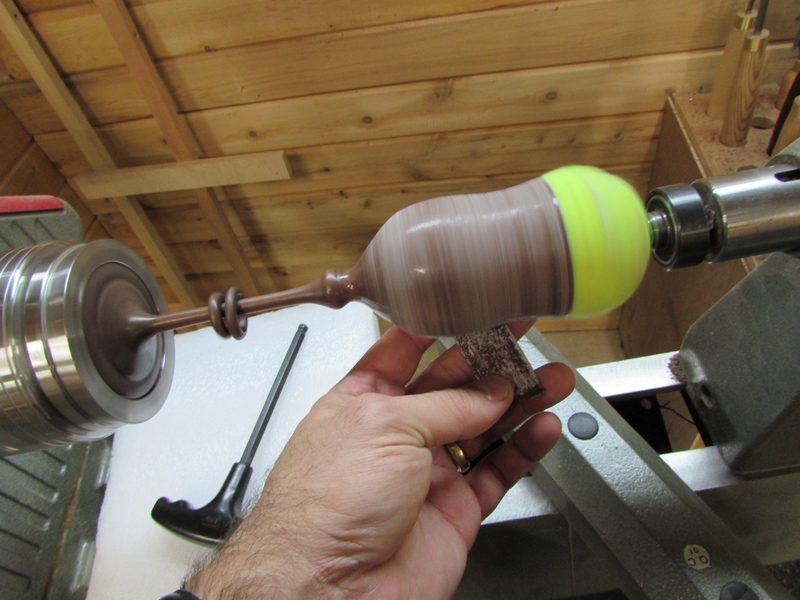 To avoid drips, I had the bright idea to chuck it up in the lathe and turn it at 100 rpms for about an hour while the epoxy set up. 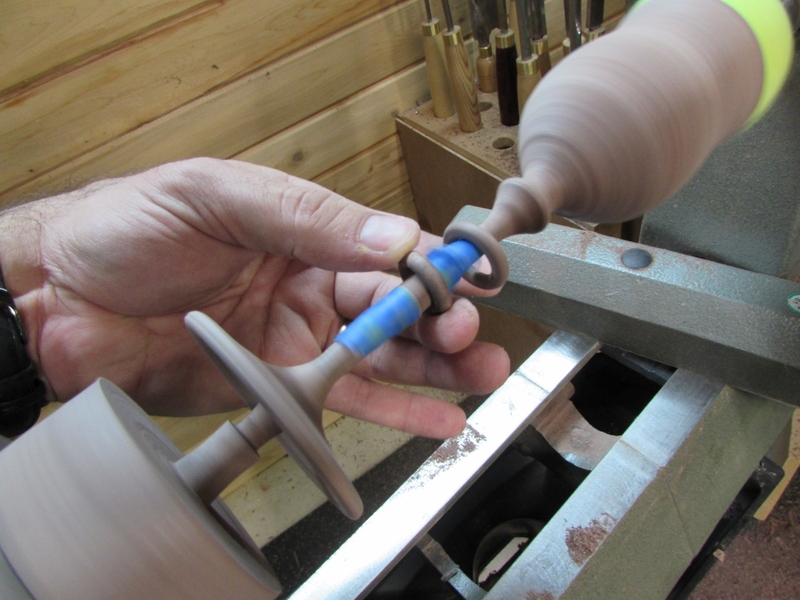 The spinning motion did not allow any drips to form. 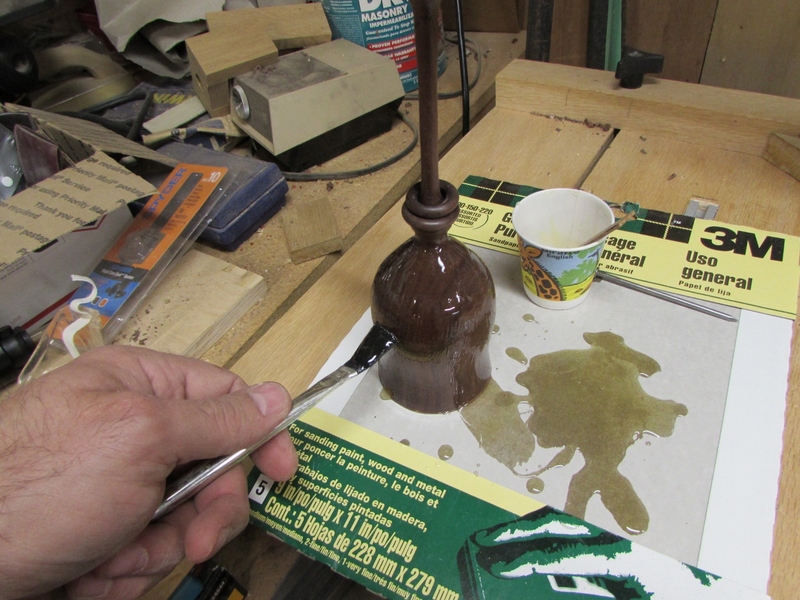 Unfortunately a common problem with epoxy is the bubbles that form from the epoxy heating up while it hardens. 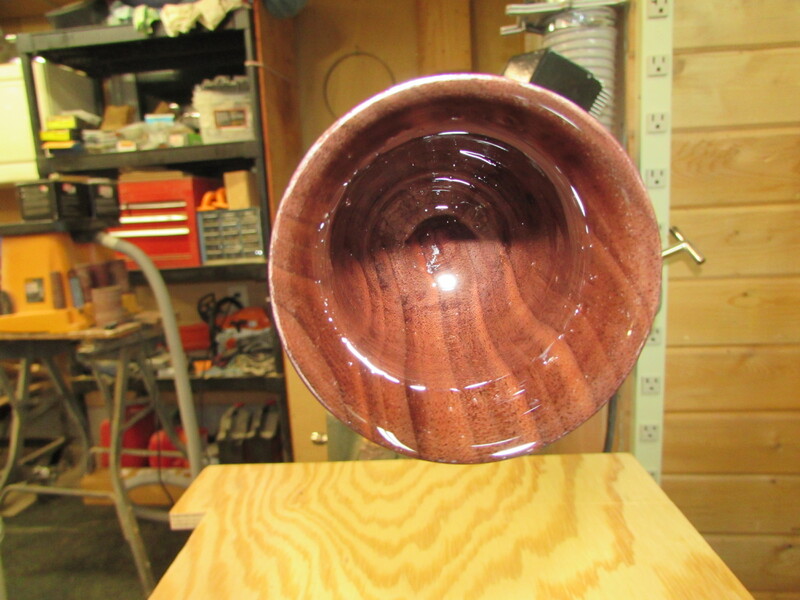 I tried to sand it down with my 150-600 grit turning sand paper, then used a one step polish. 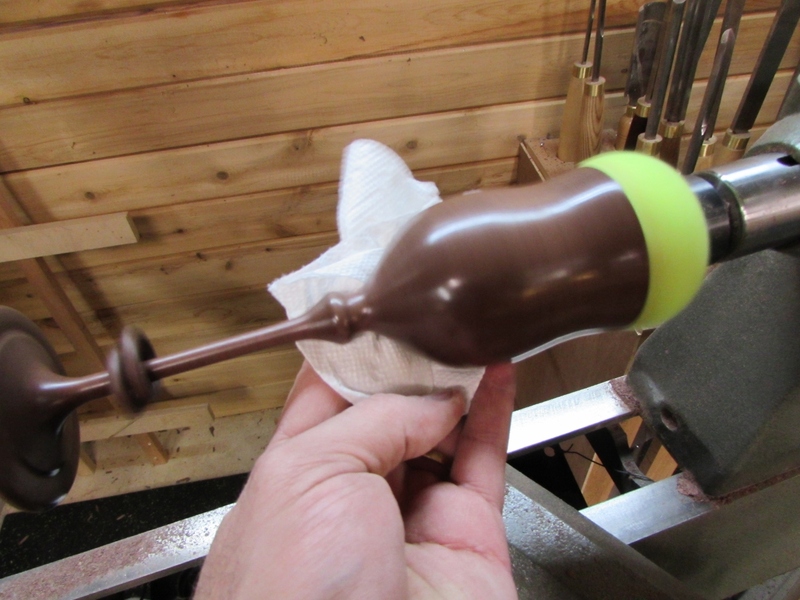 It shined up ok, but the polish left white stuff in any remaining bubble pockets. 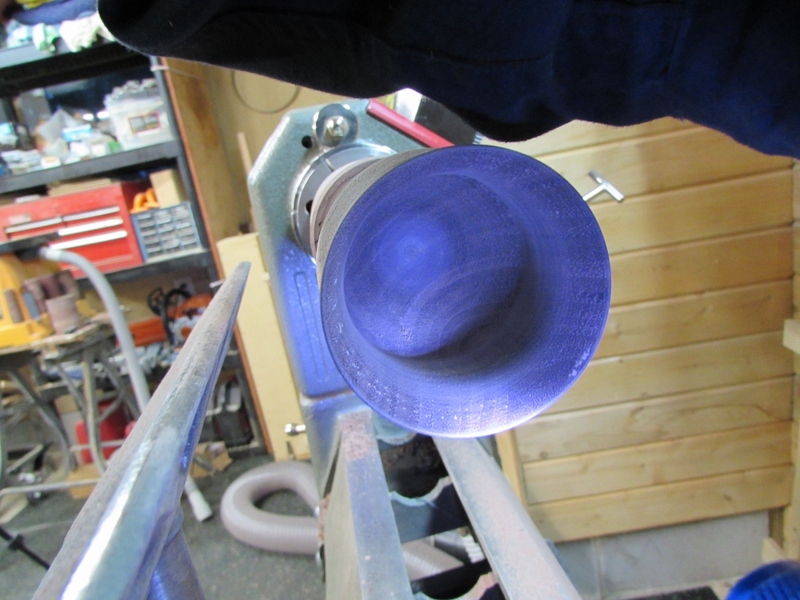 and I couldn’t polish the inside without risking blowing up the stem again. 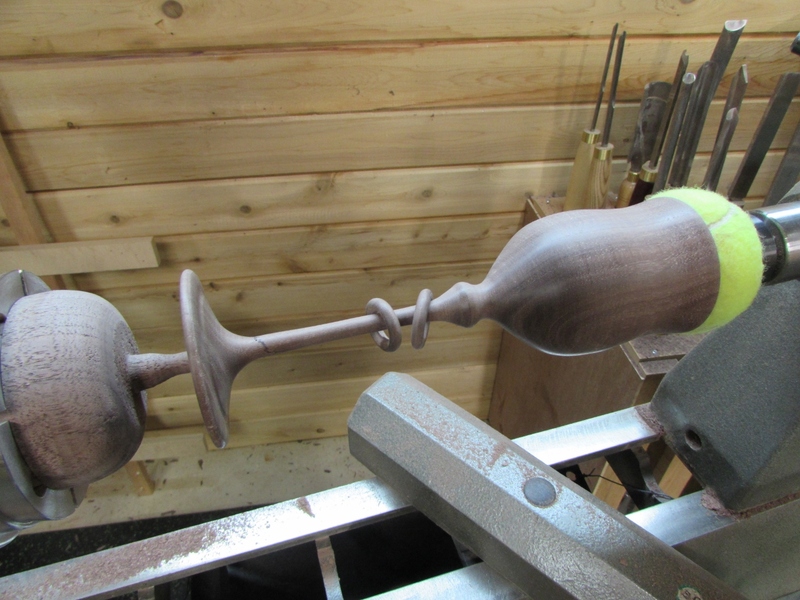 I decided on a new approach when creating the next one. 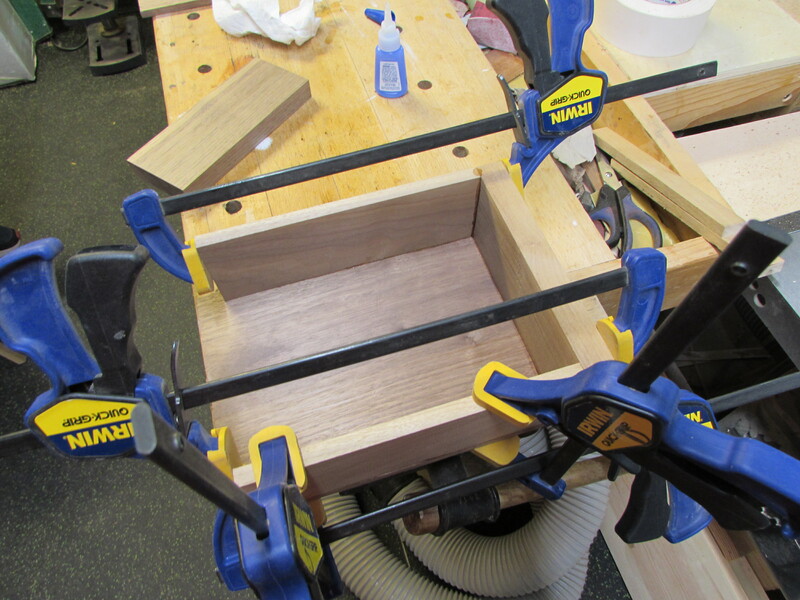 It would take longer, but ultimately worked better. 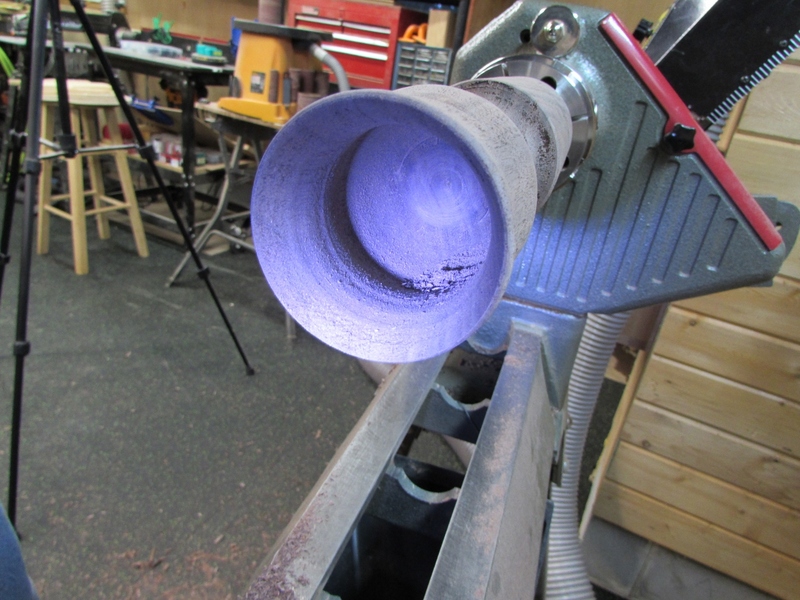 Apparently the bubbles form when the epoxy has an exothermic reaction (gets hot when mixed). 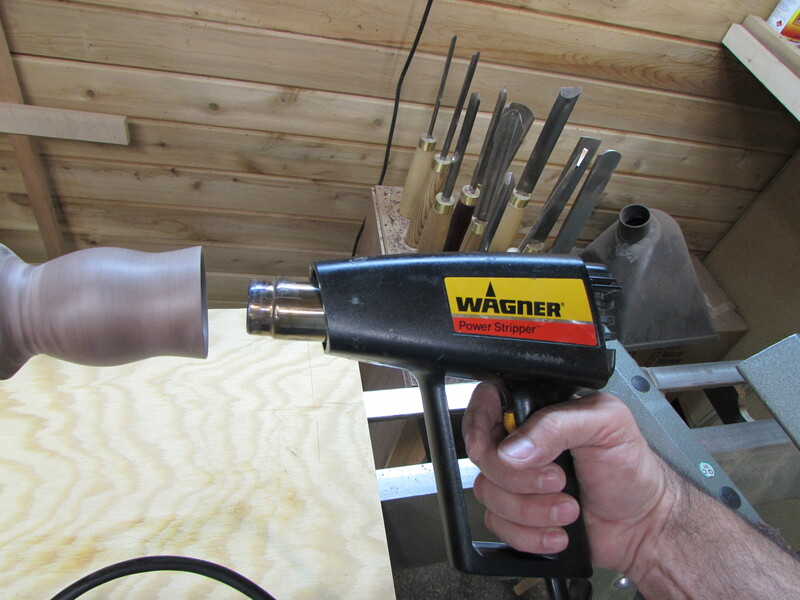 To combat this, I used a heat gun to heat the wood to a hotter temperature than the epoxy could achieve. 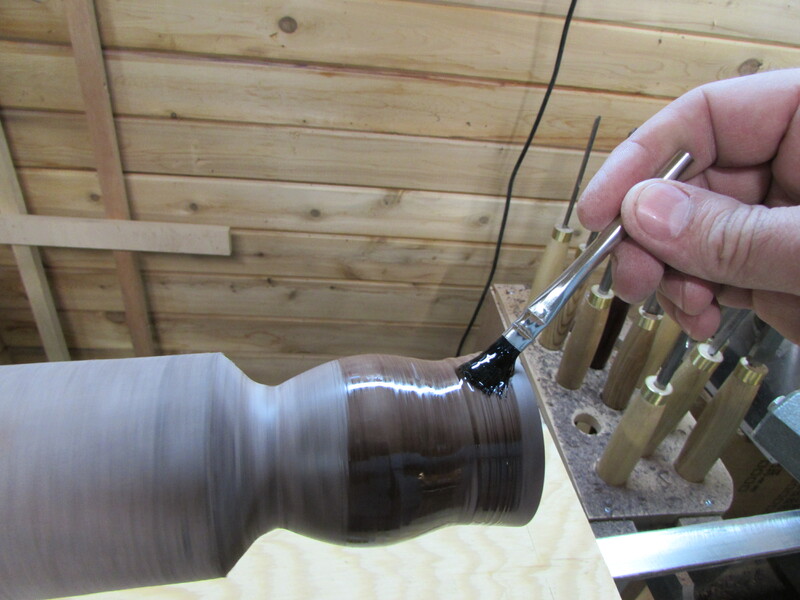 I also applied the epoxy before cutting the stem so I could polish the inside as well. 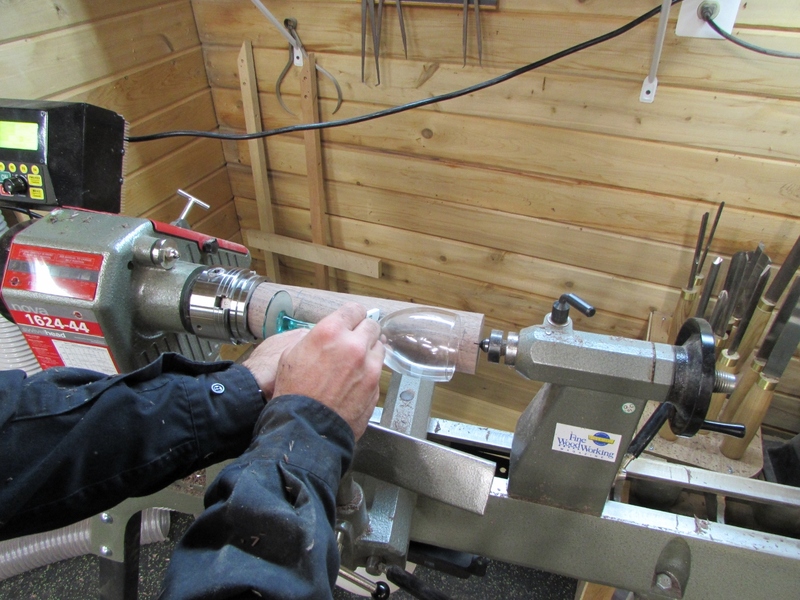 The result was significantly less bubbles. 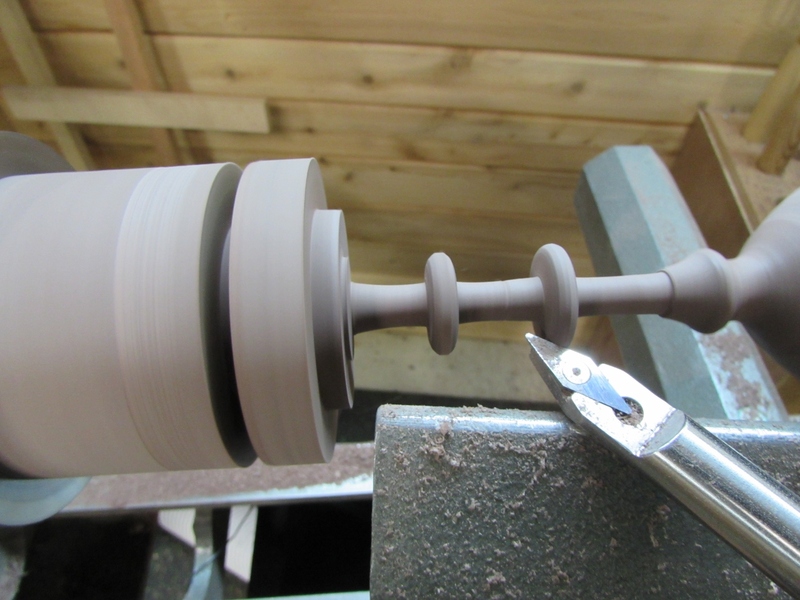 I did manage to blow up the second one as well, as well as completely cut through the base, so I started two more, and made the stem slightly thicker this time. 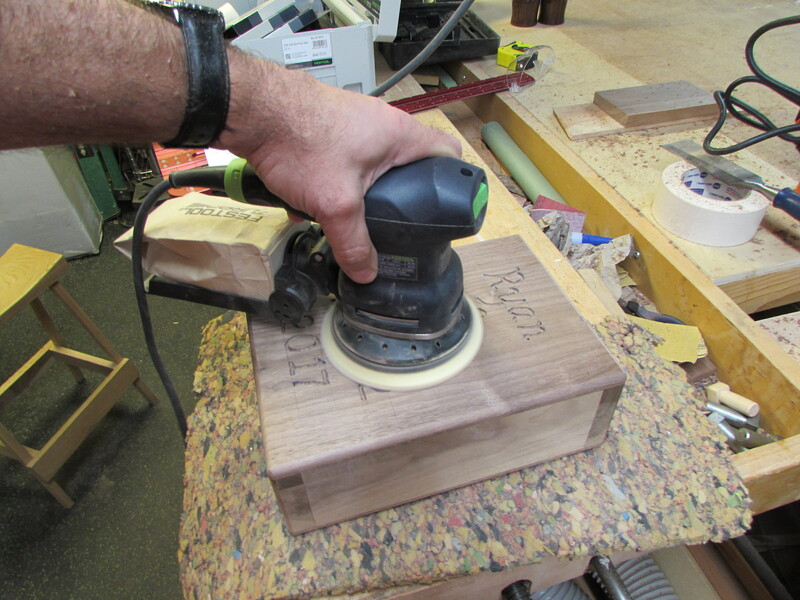 I also used the sanding pads for polishing acrylic pen blanks instead of sand paper. 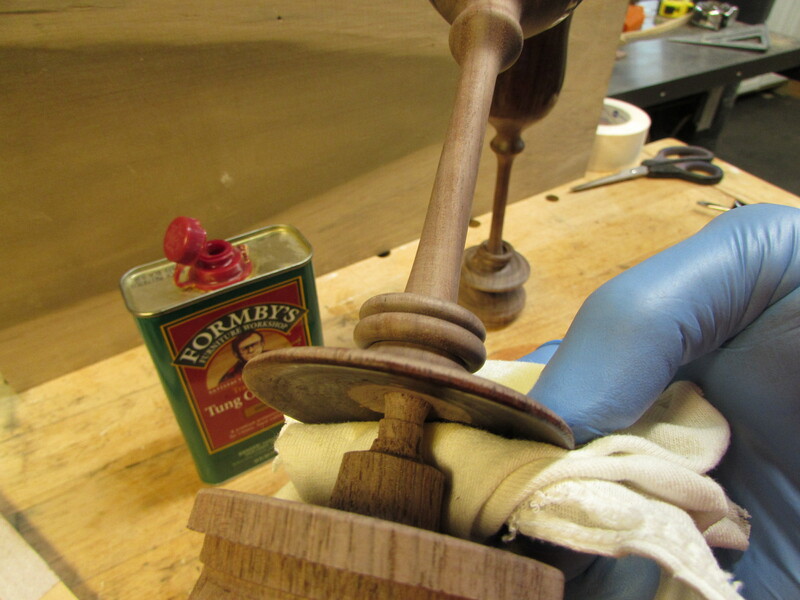 They use a wet sanding method and they go up to 1500 grit. 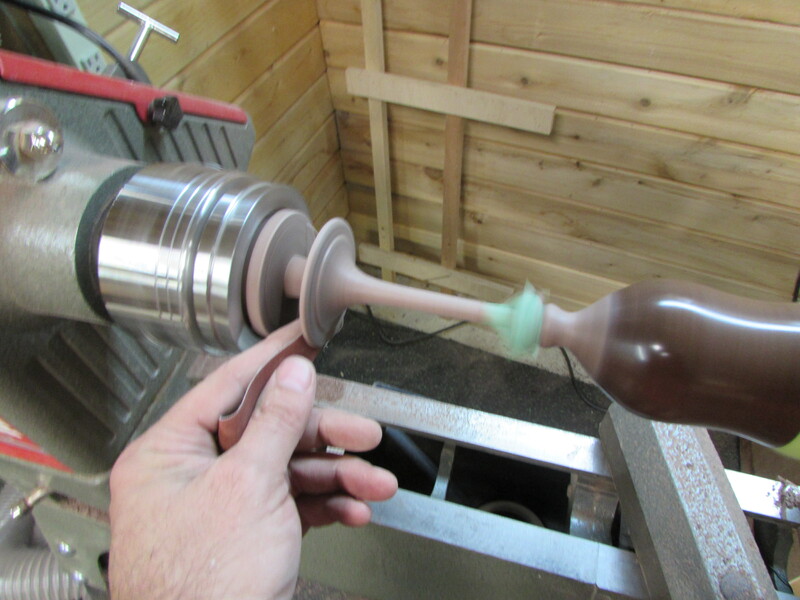 This removed the need for the polishing compound. 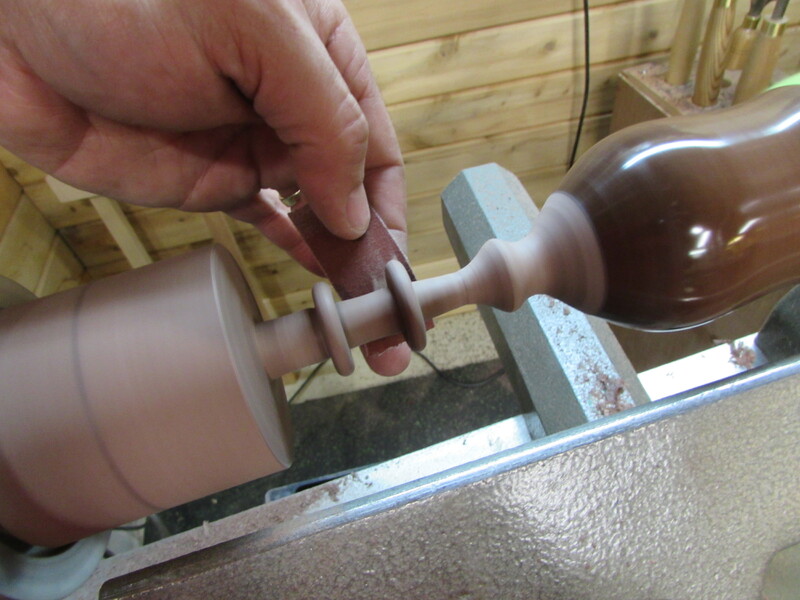 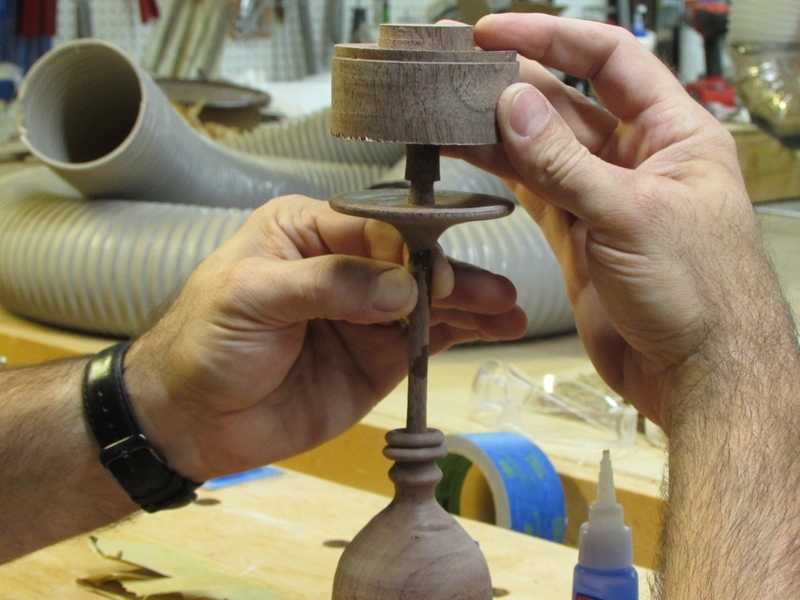 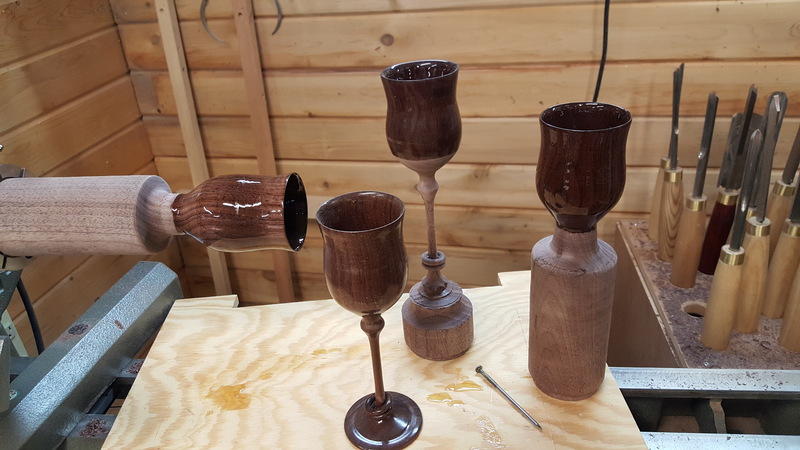 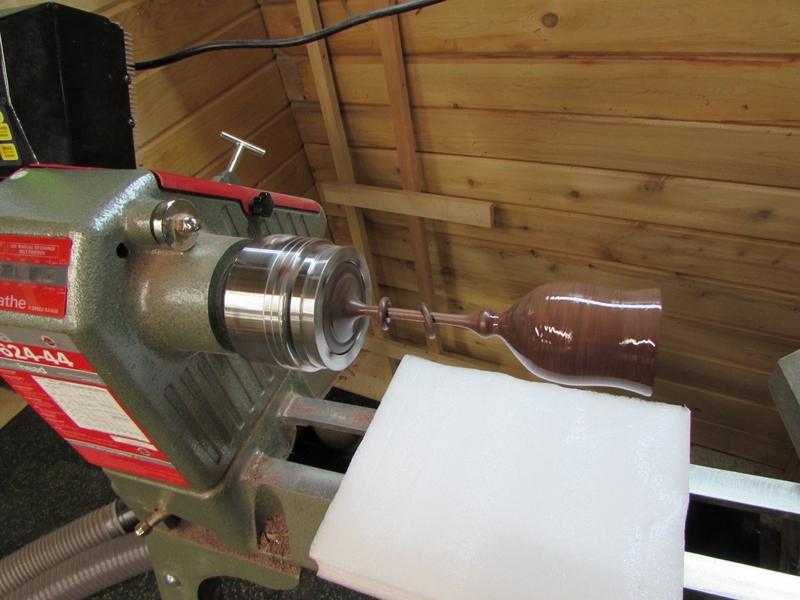 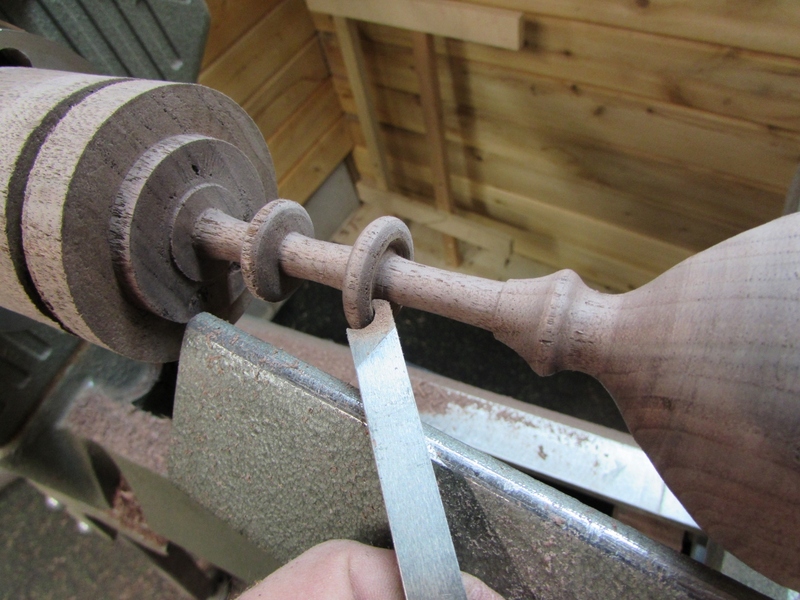 After cutting and pre-finishing two successful goblets, I cut away all but a tiny connection to the base of the goblets so I had a stand for finishing. 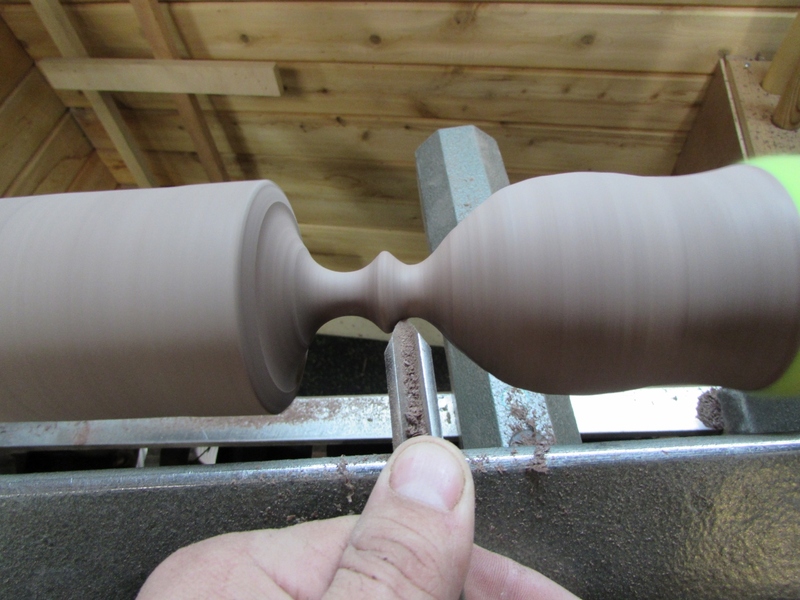 This allowed me to finish the bottom at the same time. 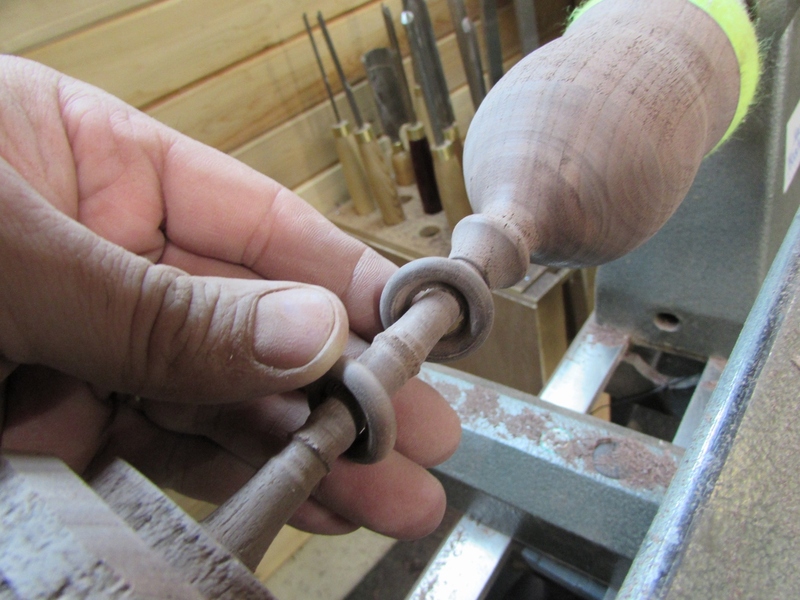 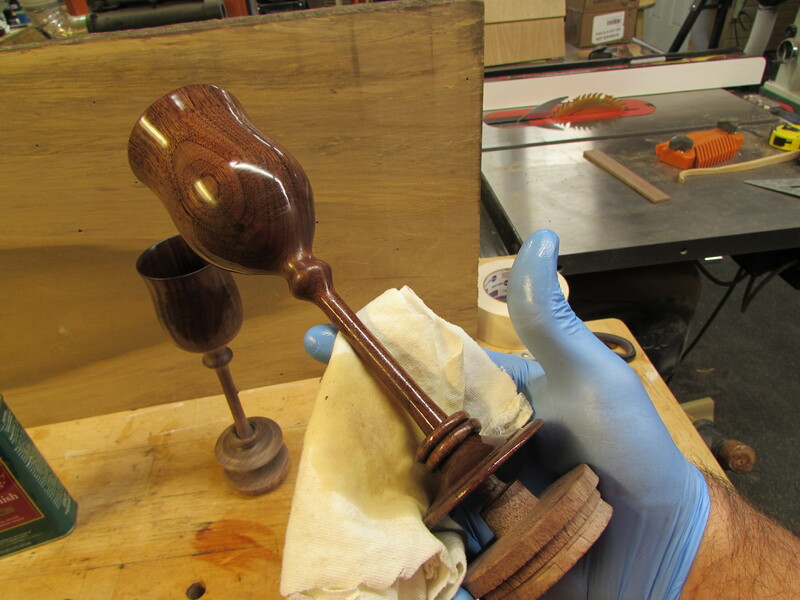 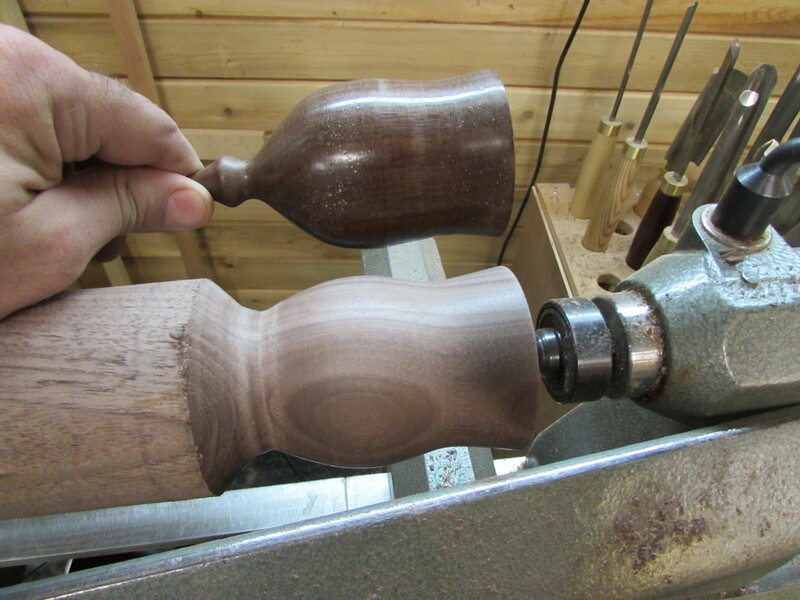 For the rest of the goblet, I applied several coats of tung oil. 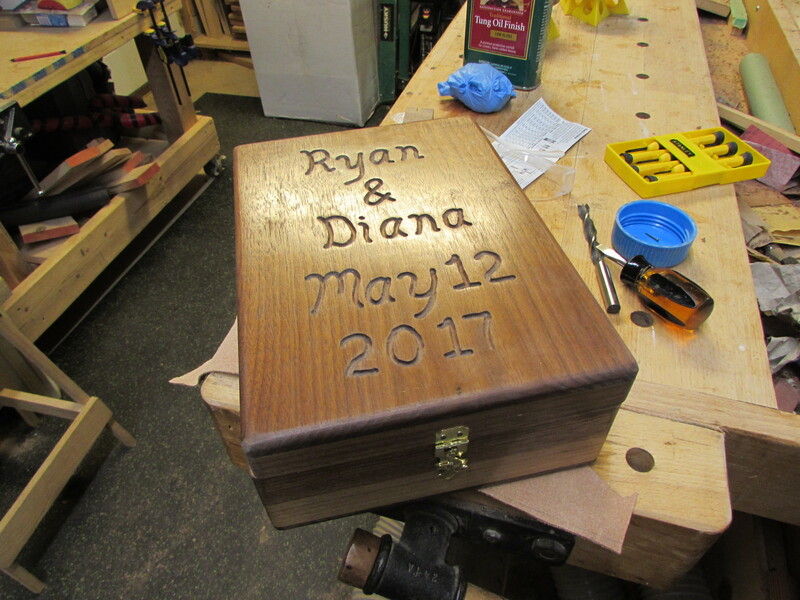 Since I still had a day before I gave them to the happy couple, I decided on making a box to present them in as well. 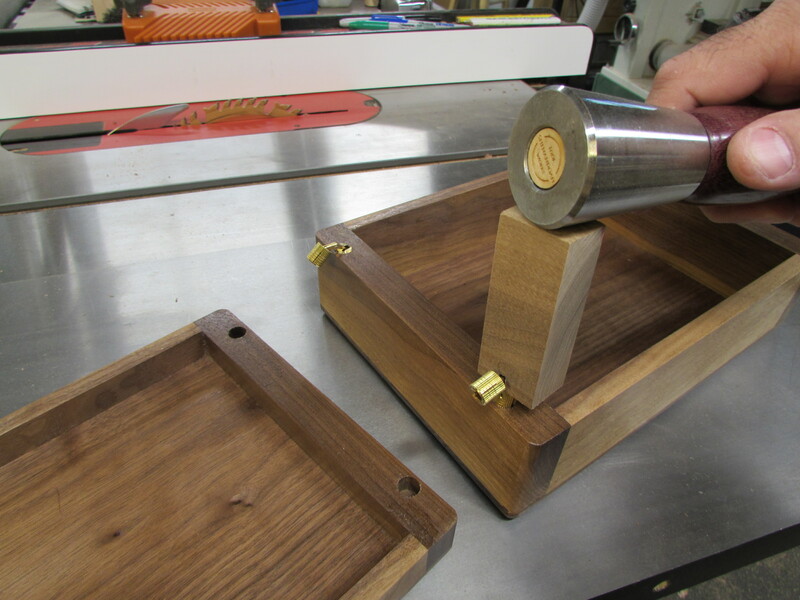 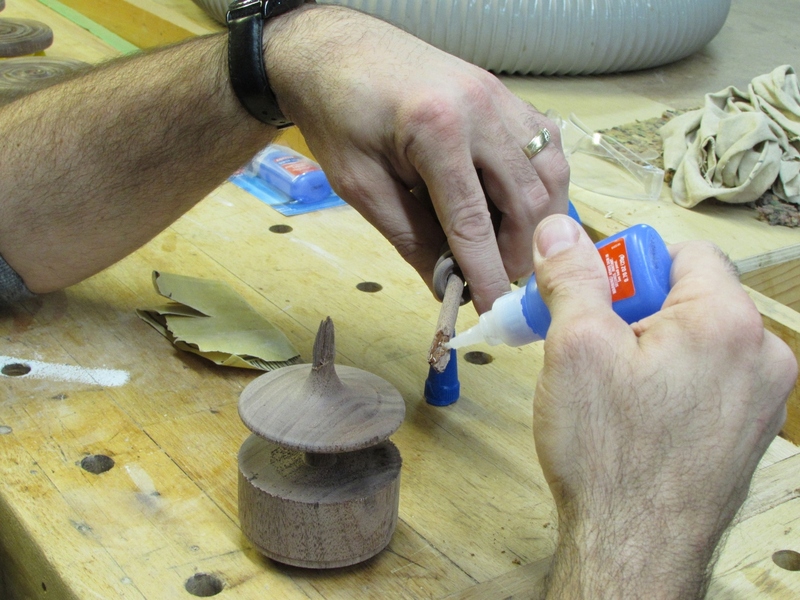 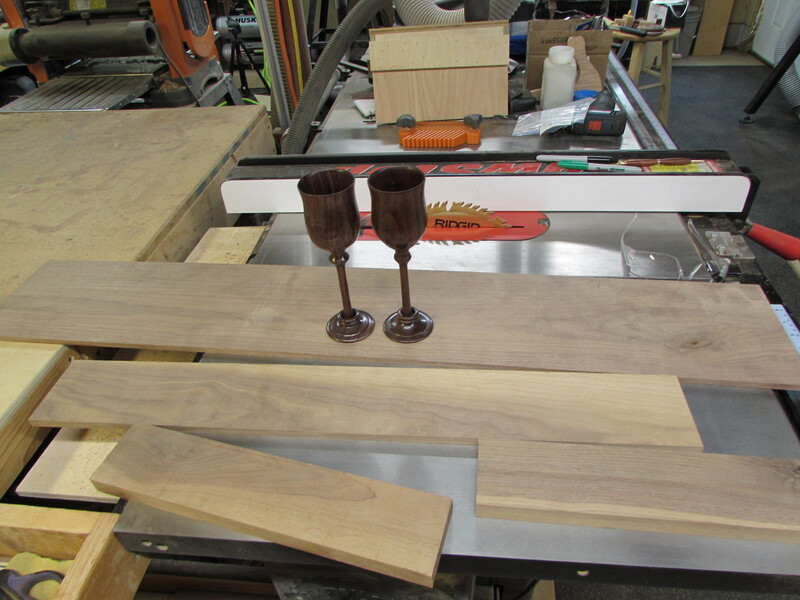 Basically I grabbed some scraps of walnut and roughly sized the box around the goblets. 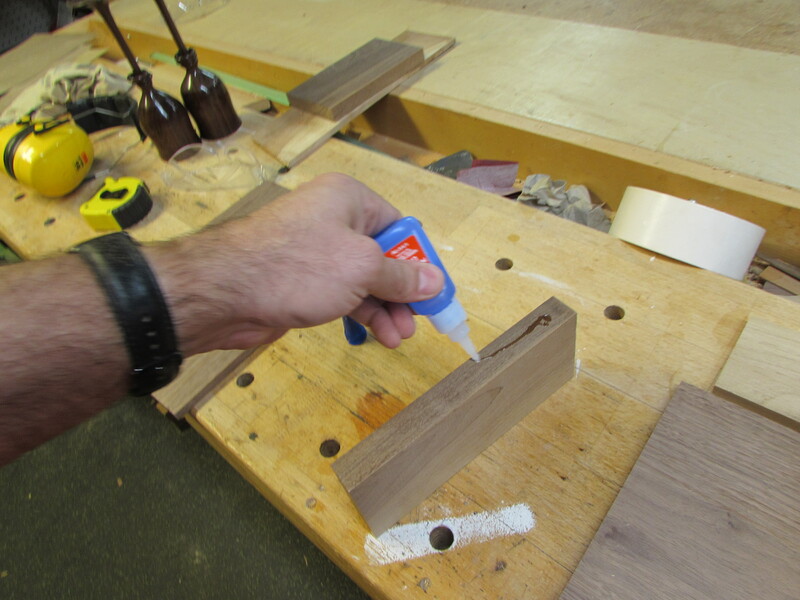 Since I only had a few hours to work, I used my quick-setting super glue. 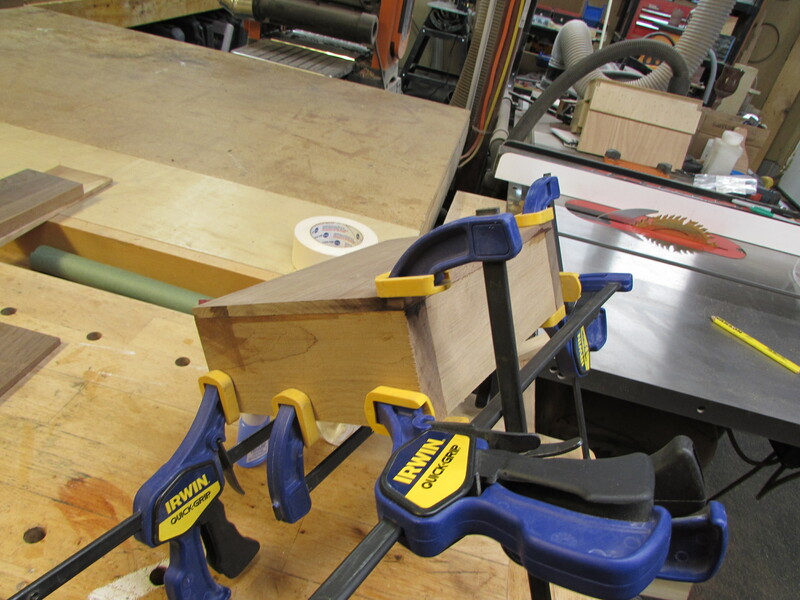 I clamped up the sides, then added the top and bottom as well. 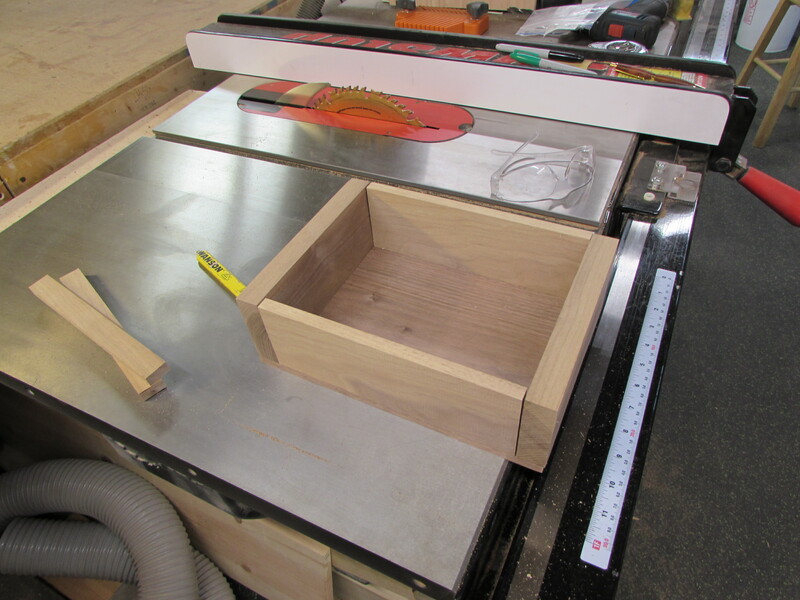 I used the table saw to clean up any over-long pieces. 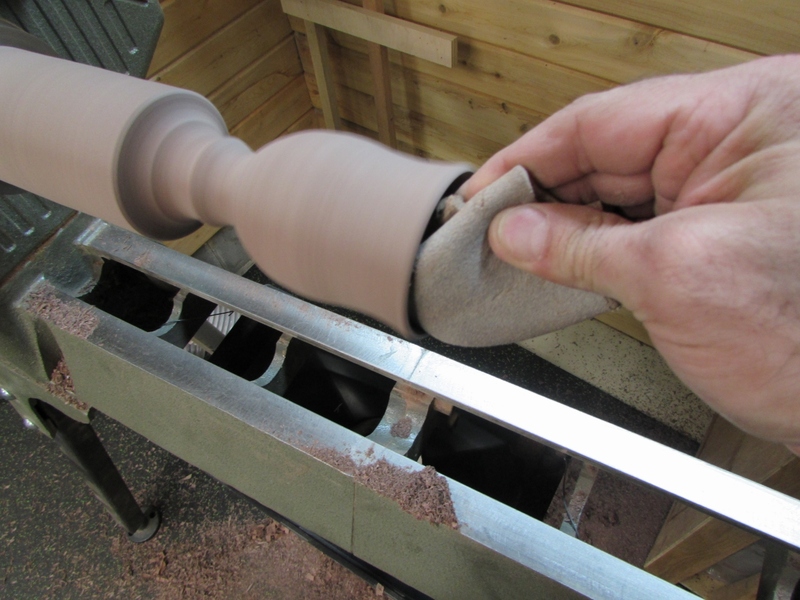 Then I planed it smooth. 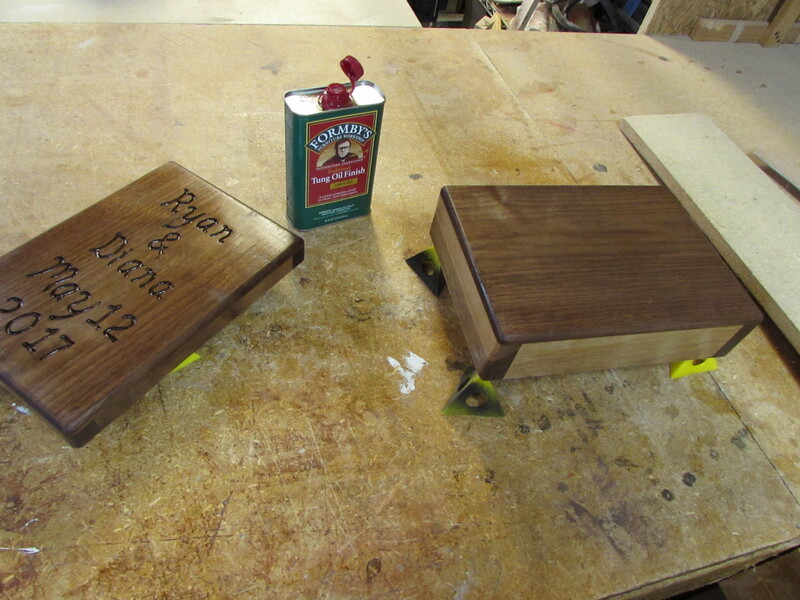 I laid out some construction lines on the lid and had my wife neatly write the names and date on the lid of the box. 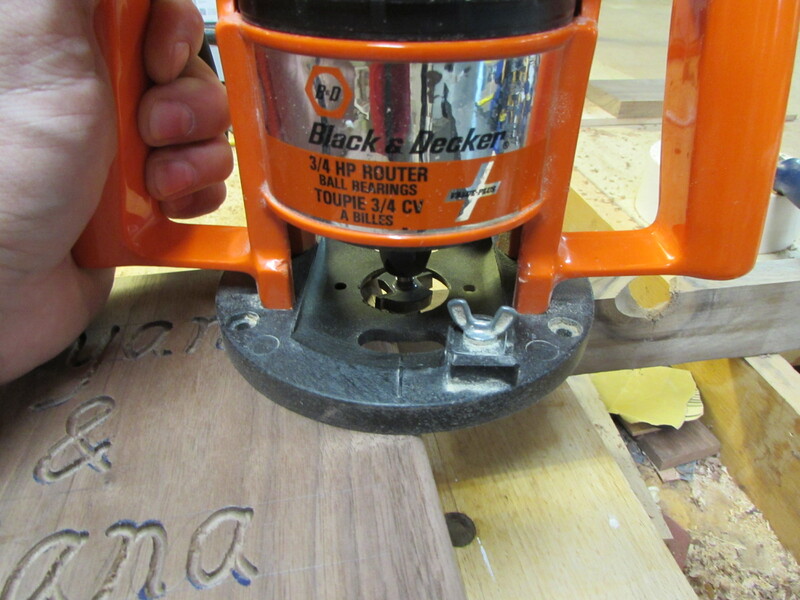 I traced it with a sharpie to make it easy to see, then put a 1/8″ bit into my smaller fixed router. 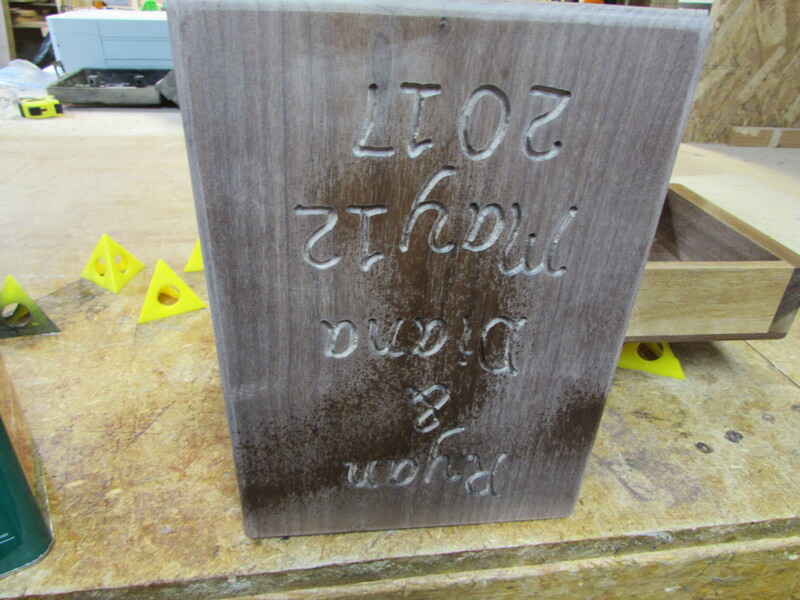 I quickly free-handed the text, about 1/8″ deep. 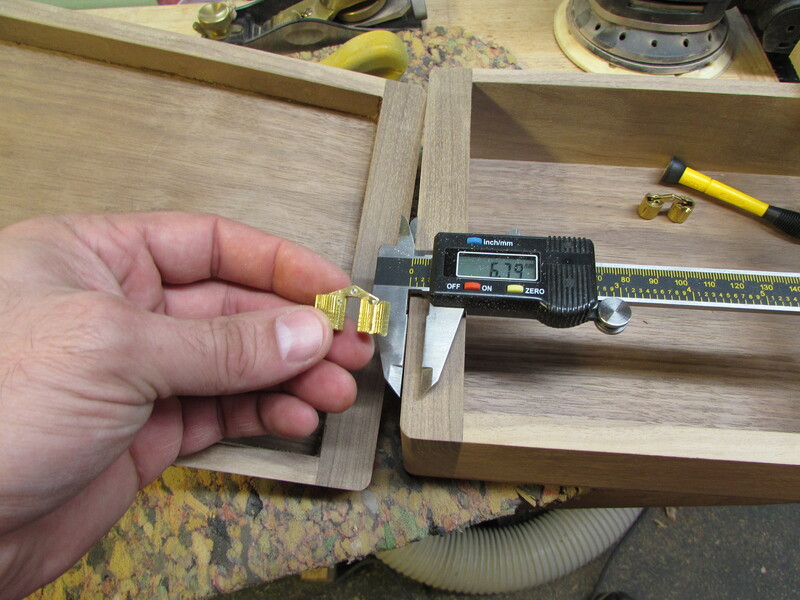 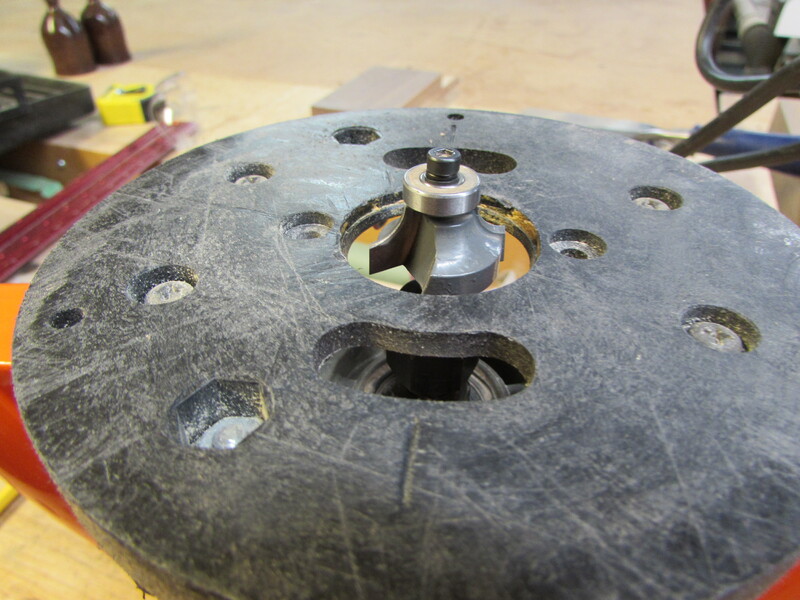 Then I loaded in the 1/4″ round-over bit and went all the way around the boxes edges. 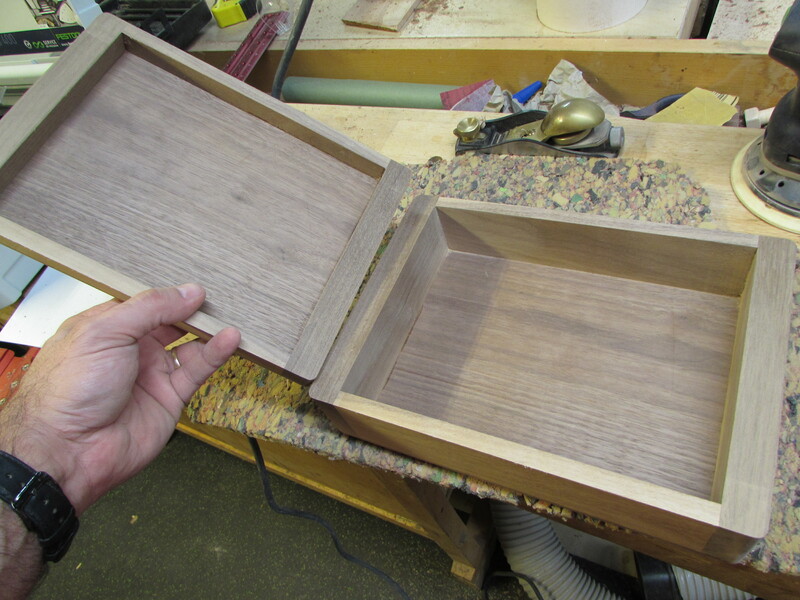 Next I gave it all a good sanding. 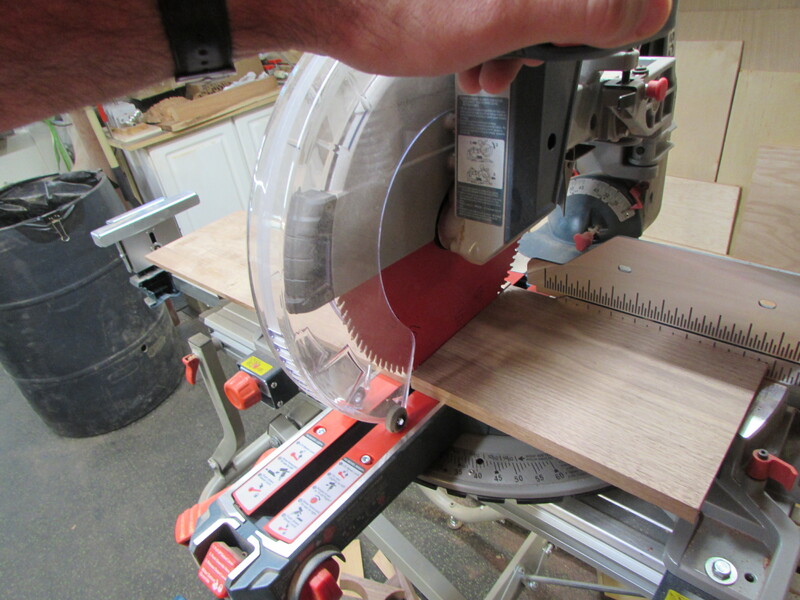 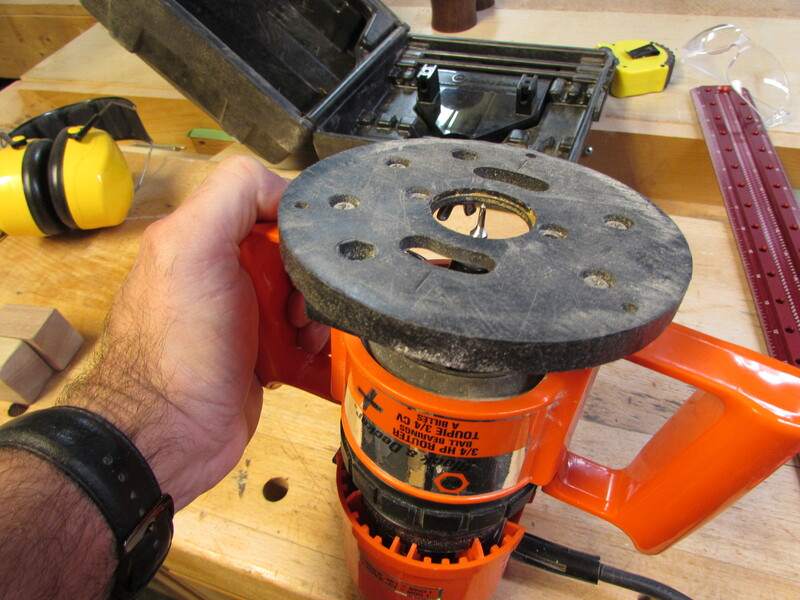 I used the table saw to cut away the lid. 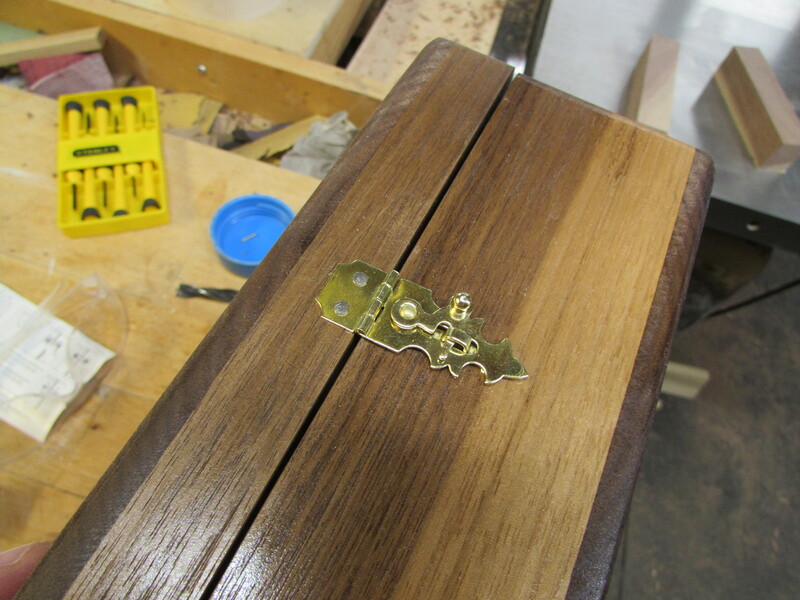 I had two left-over barrel hinges from some old project, and they were perfect for the hinge. 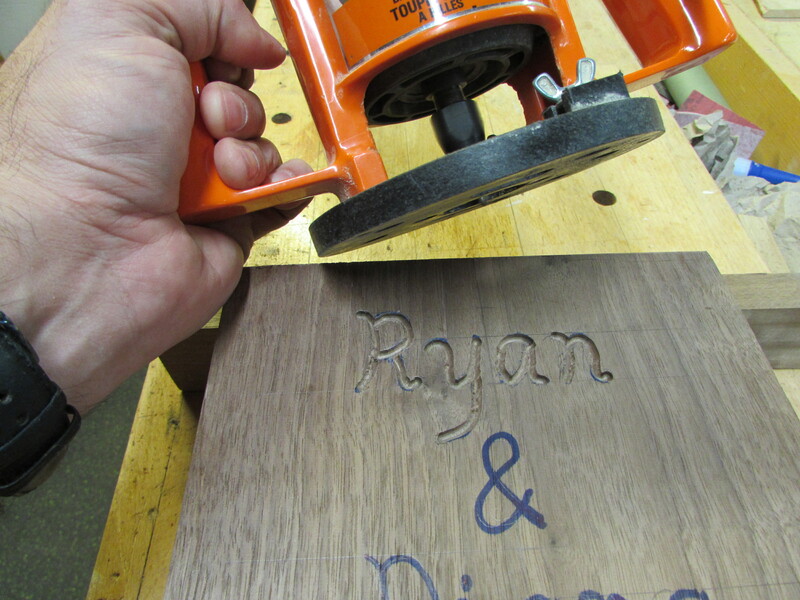 I marked everything and drilled it out. 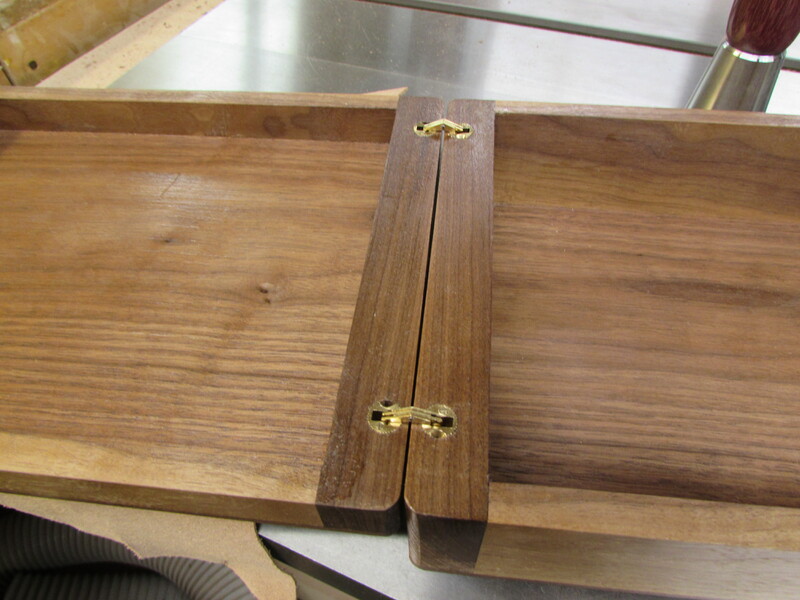 After a test fit, I grabbed my spray shellac and tried to give it a quick finish. 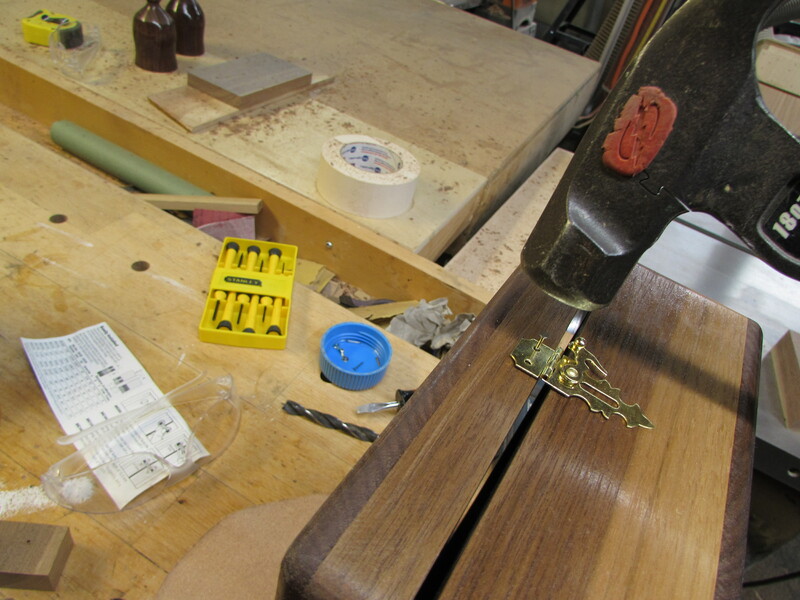 Apparently someone used up all my shellac. 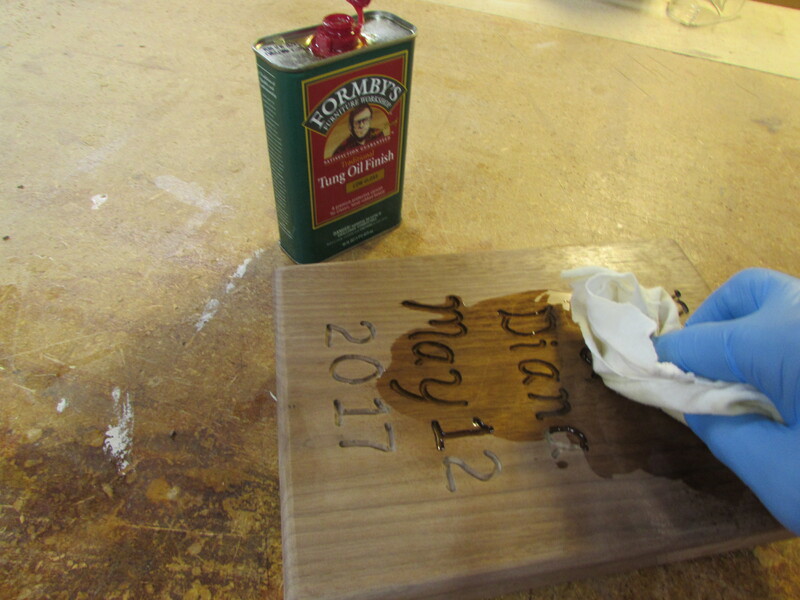 I did not have enough so I turned to my tung oil. 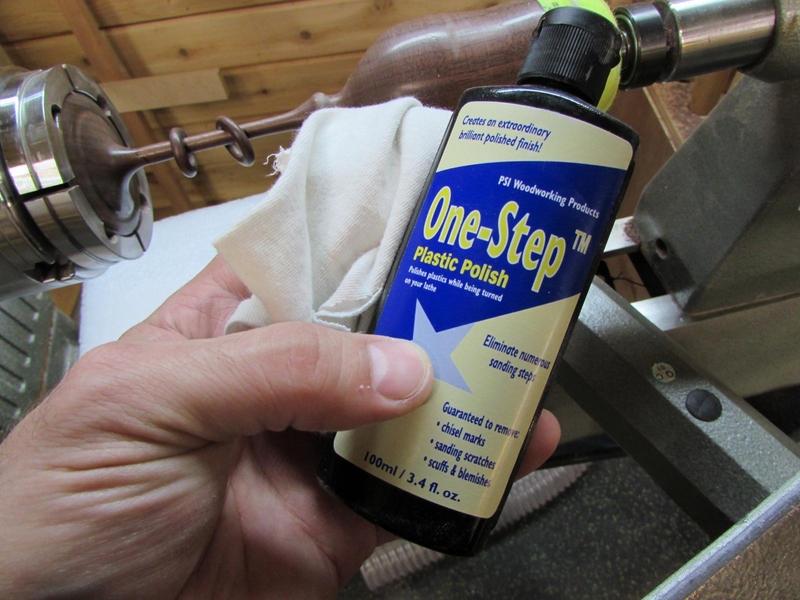 I was able to get three coats applied before morning. 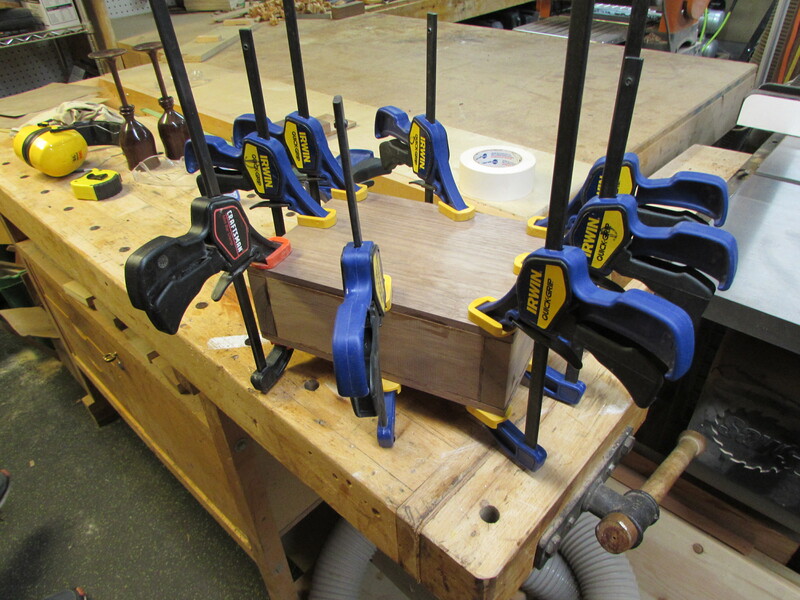 So that will have to be enough. 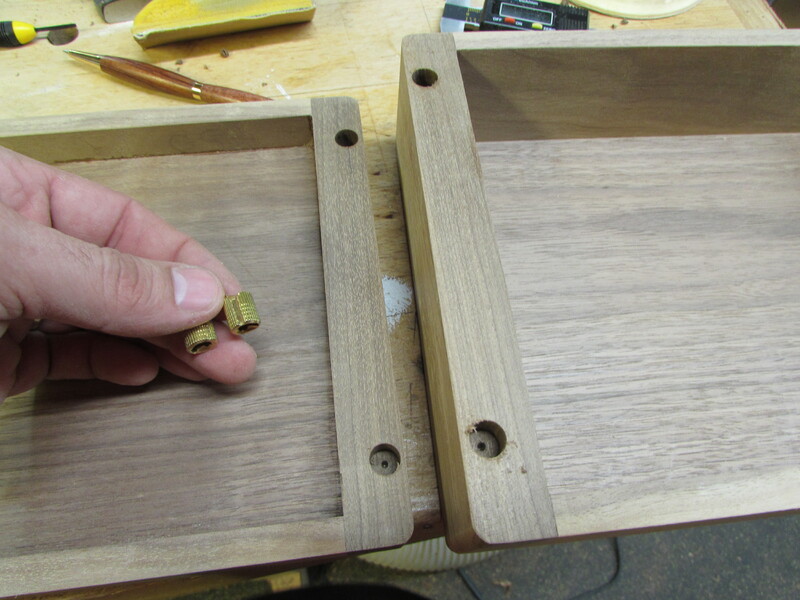 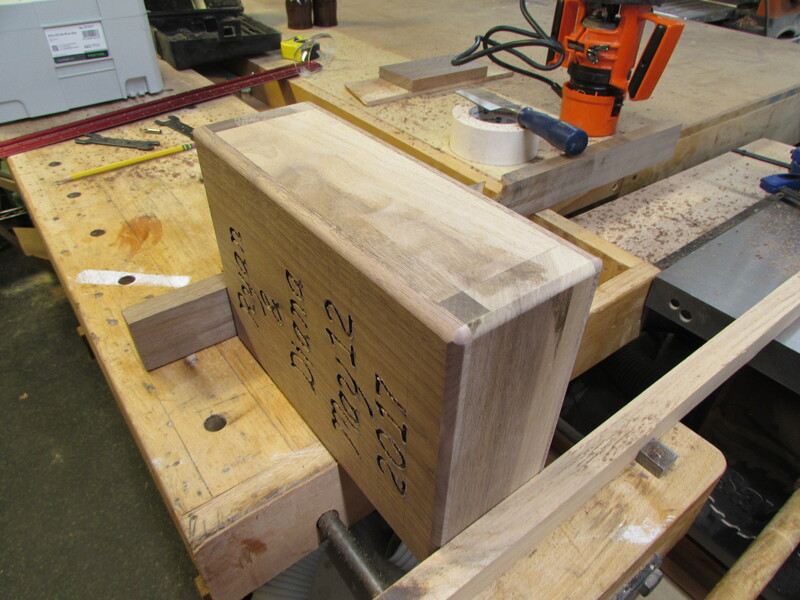 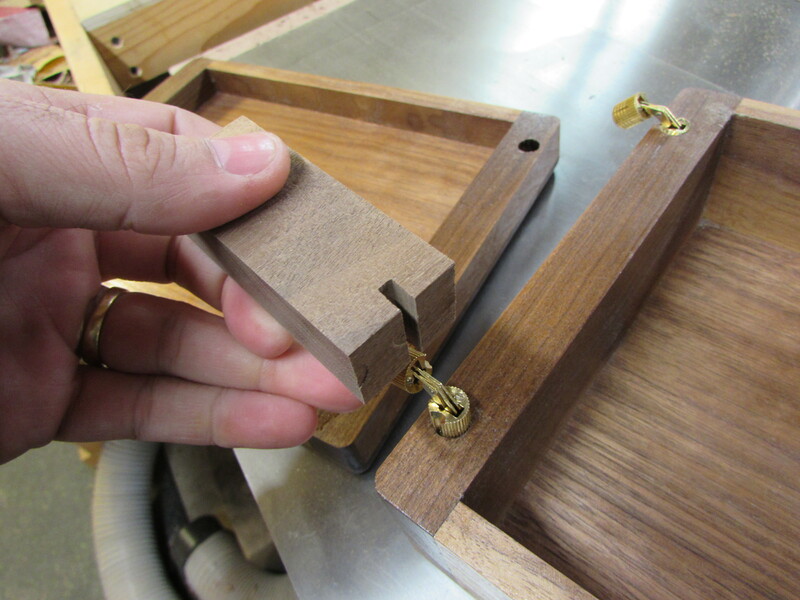 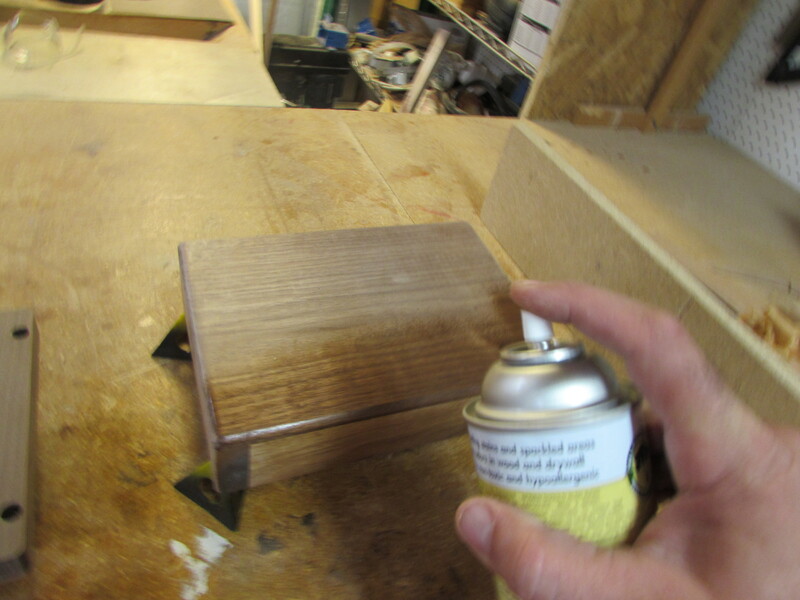 I made a block to use, to press fit the hinges in place, then smacked them in with a mallet. 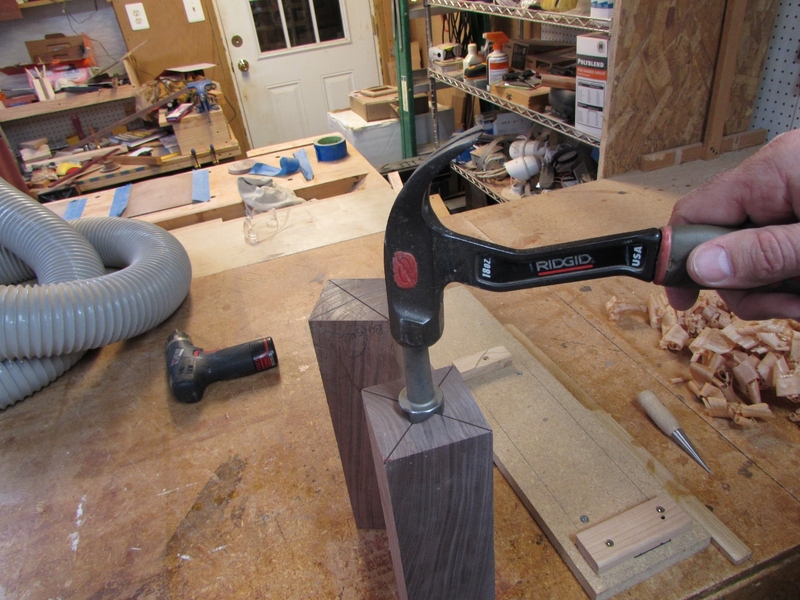 Slightly off, but not bad. 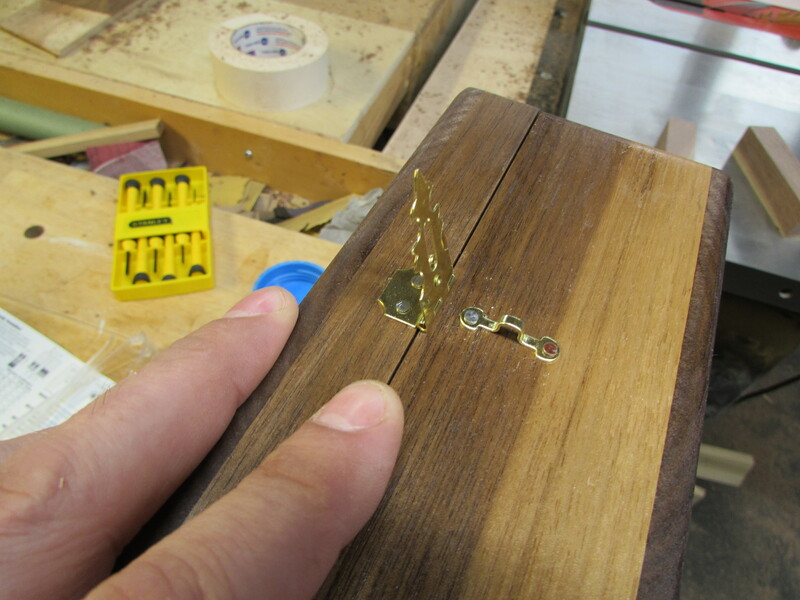 I also had an extra latch, so I installed that as well. 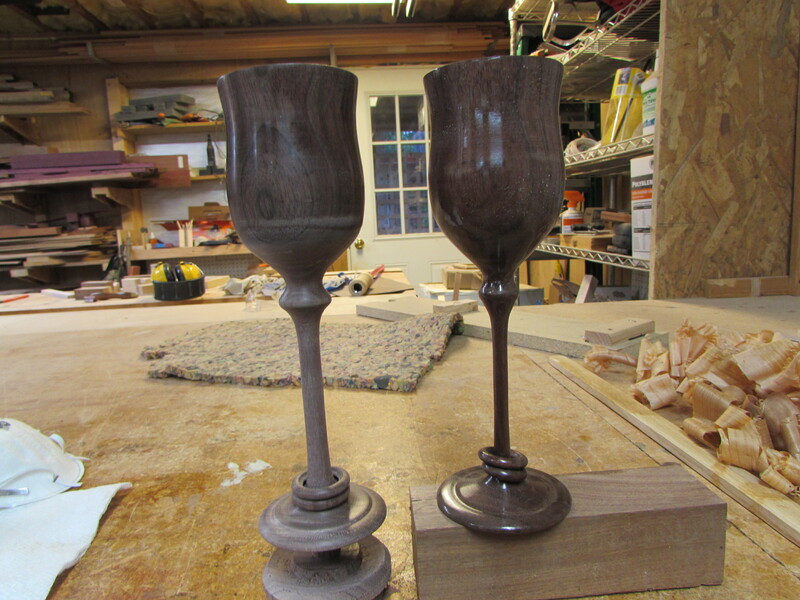 I had saved some cedar shavings from the garden bench and packed them around the goblets. 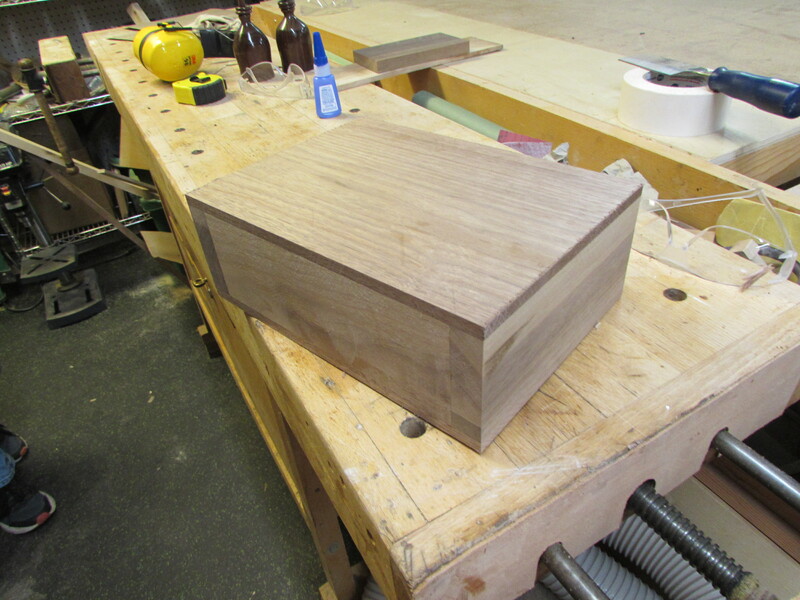 Not bad for a rush job. 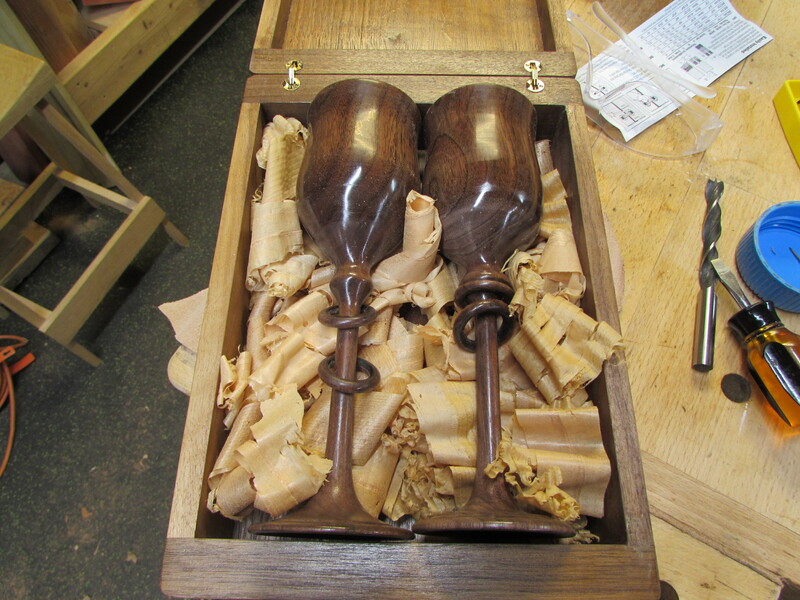 This entry was posted on May 15, 2017 by Lwroten in From the scrap bin..., Misc... and tagged barrell hinges, captive rings, carter axe turning tools, Diana's wedding, walnut goblet, wedding goblet.